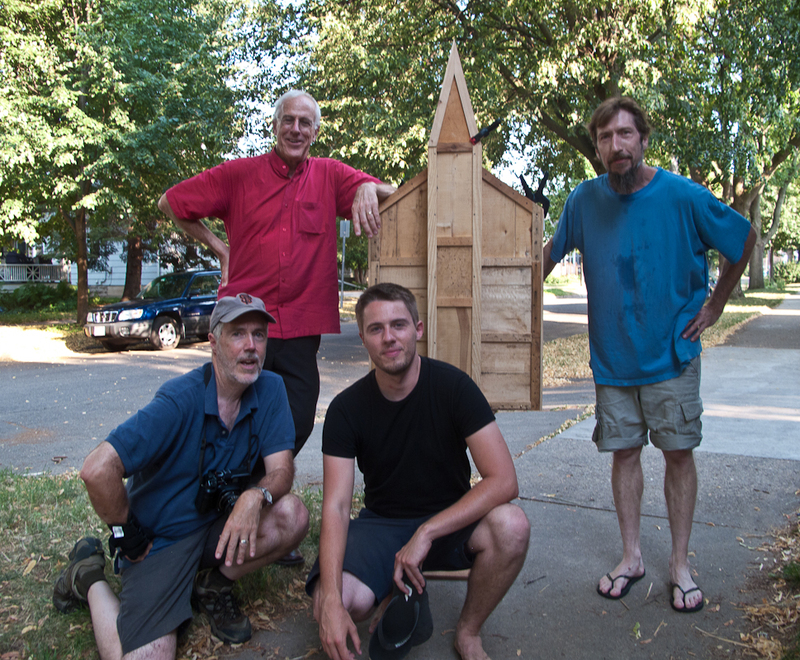 6/26/12 – We spent one of the most interesting hours of this trip with Todd Boi and the Little Free Library project in Hudson, WI. This project has spread throughout the country in a short time. 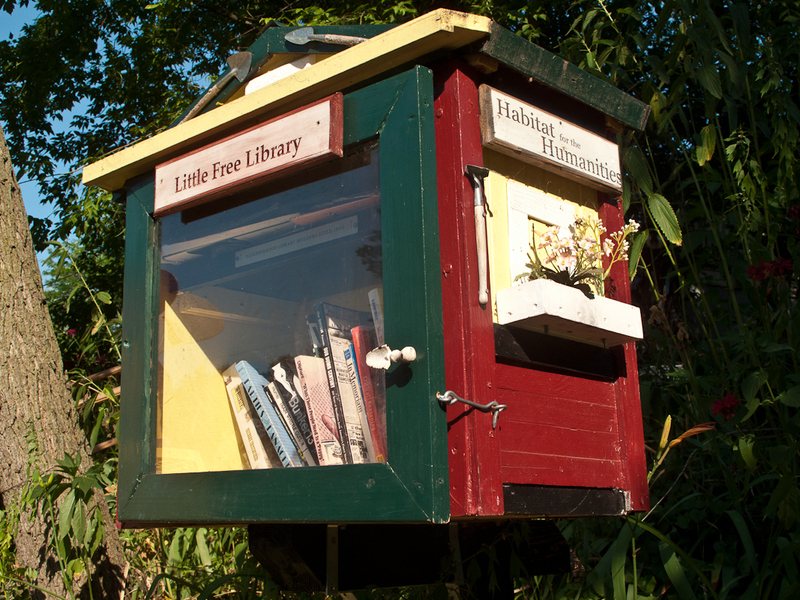 The idea was to have free libraries placed in the crate-sized structures that looked like little houses or small libraries. People put them in their front yard or other public spaces. Readers could borrow books and return them when they are done. They can add their own books to the collection as well. 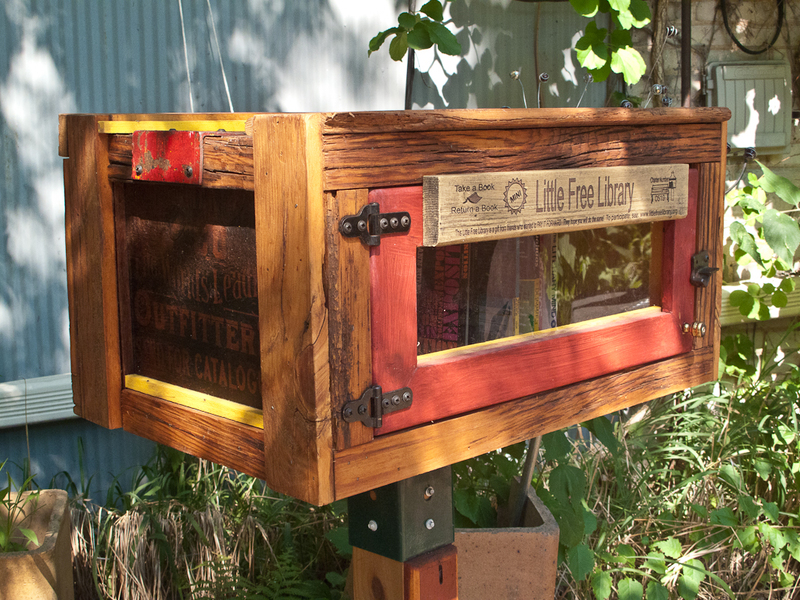 It is a way of building community through Little Free Libraries. Todd and his wife are delightful. They charm Walker with their adorable puppies. They give me a cup of coffee in a Little Free Library mug and tell me to keep the mug. We left feeling like we had met kindred souls. 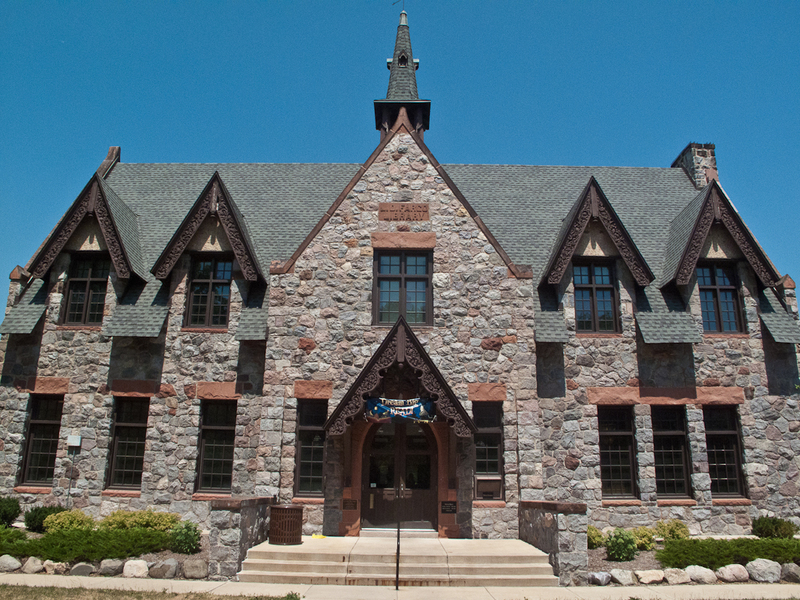 The Sparta, WI library was a stunning Carnegie. Because we were traveling far today I only photographed the beautiful exterior. 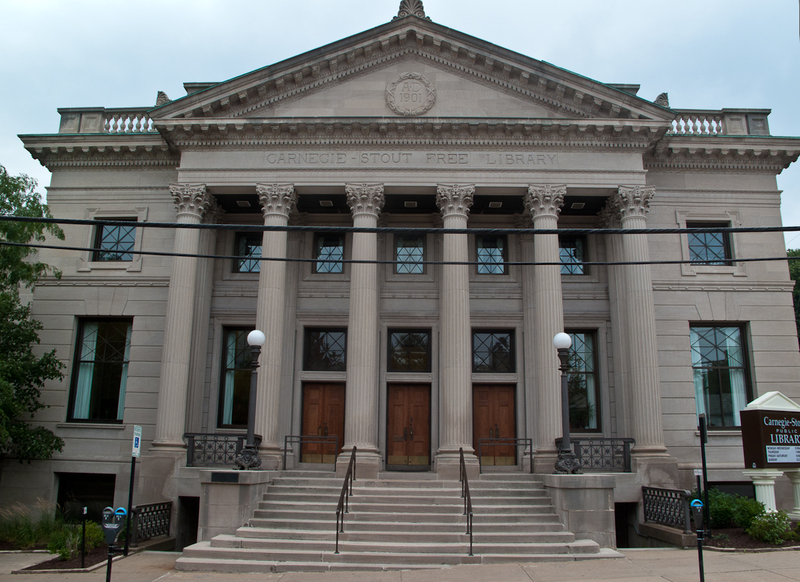 Oshkosh, WI was a surprise with its faded charm and large Carnegie library. 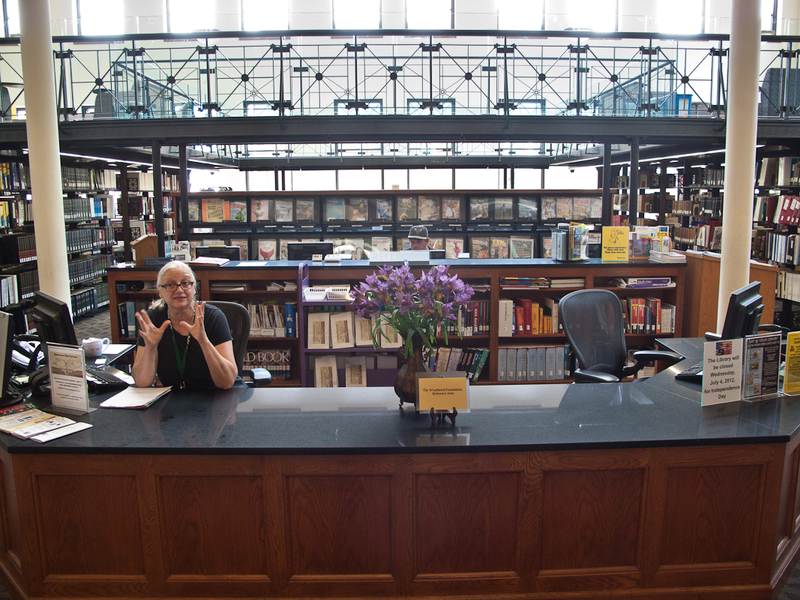 As usual, I walked through the library first with my digital camera sizing up the interior and deciding if I wanted to speak with the librarians. If the interior is interesting I then come back with my film camera and tripod. Because we were in a hurry I didn’t expect to stay long. Unfortunately for our timing, the interior was really good. The librarian was patiently talking on the phone with an abusive library user about a book fine. After she finished that frustrating call she graciously gave me a wonderful tour of the library. Talk about being flexible. This is one reason why I have so much respect for librarians. We ended our long drive in Milwaukee, WI. Neither Walker nor I had any idea that this city would be so great. 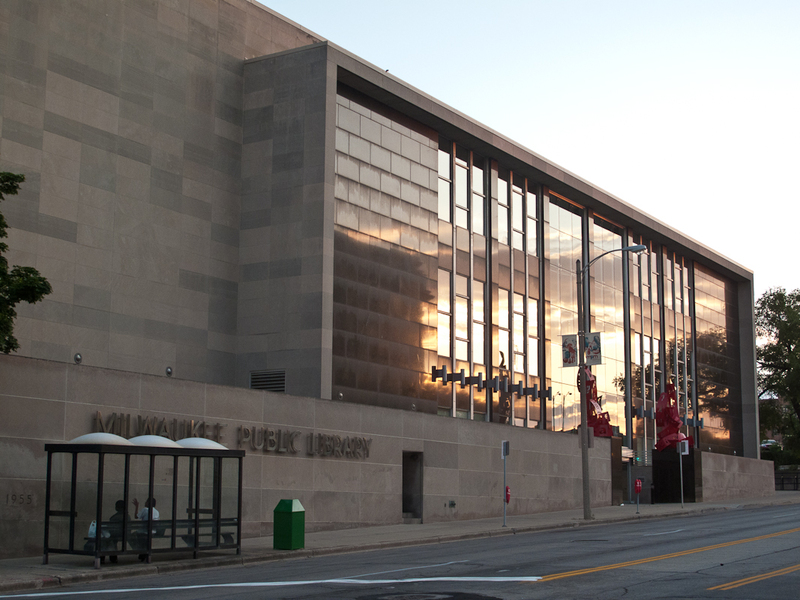 We drove straight to the Central Library to catch the remaining light of dusk. The lighting on the old building was spectacular. The streets were deserted but I felt very comfortable in this big city on Lake Michigan. We ended the day over dinner wondering why a city of this size and character existed so close to Chicago. 6/27/12 – Our day began talking on the phone with Ellen while sipping great coffee in the sun on the shores of Lake Michigan. We were delighted to experience this part of the city. 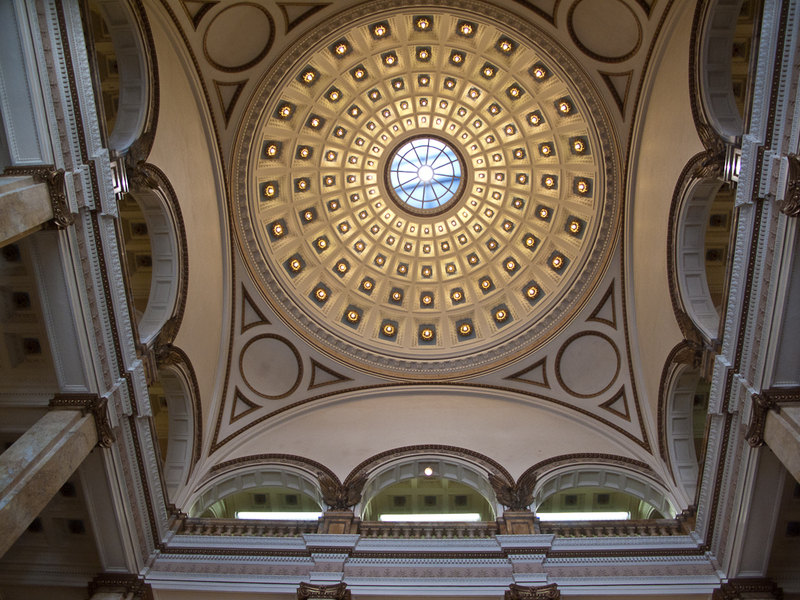 We went back to the Central Library in Milwaukee and I spent two hours photographing the massive interior of this great library. In every library I try to photograph things that are unique to the local culture. 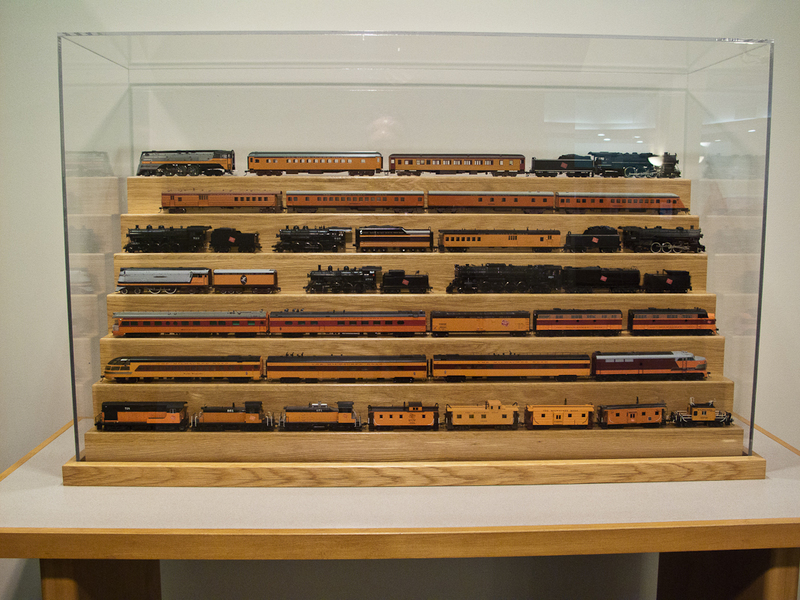 Here I made images of model trains and Lake-going ships that reflect the commercial background of this city. I also photographed the grand architecture that fortunately had been preserved. Although we enjoyed the pleasant parts of Milwaukee we also knew that it was more complex. The city is one of the most segregated in the country and one of the poorest. As we left Milwaukee we wanted to see other parts of the city. We found it in a large area of poverty in a mostly African-American part of town. Like Duluth, the economic collapse of manufacturing in our country hit this city especially hard. The L.D. 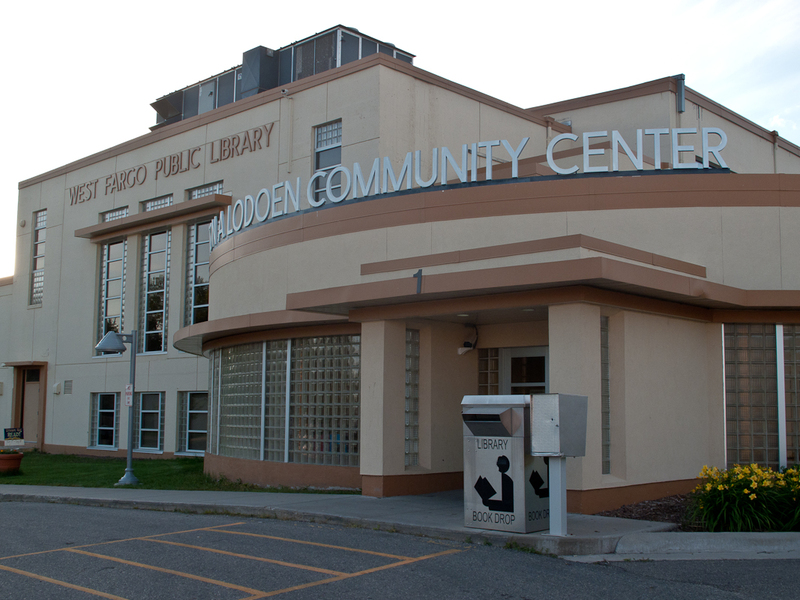 Fargo Public Library in Lake Mills, WI was next. It too was a unique place that looked like a Tudor-castle fantasy that was actually beautiful. The pace of this year’s Library Road Trip has been intense and unrelenting. At this point we realized that we needed to eliminate some of the libraries on our list that we had hoped to visit. Goodbye Sheboygan, Kenosha, Lake Geneva, Janesville Jefferson and Mazomaine. We wished we had the time and energy to visit them all. 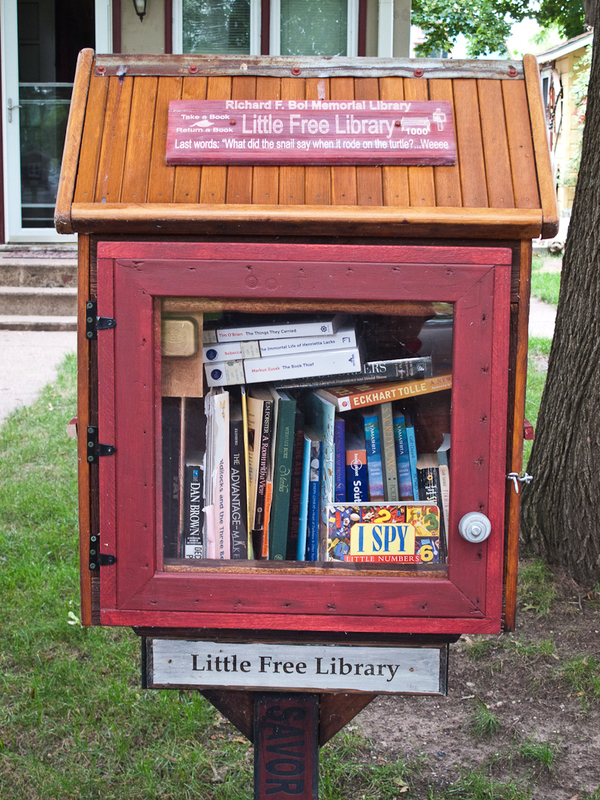 We ended our drive in Madison, WI meeting Richard Brooks, co-director of the Little Free Libraries project. Like his partner Todd Boi, Rick was a wonderful character and a fascinating person. 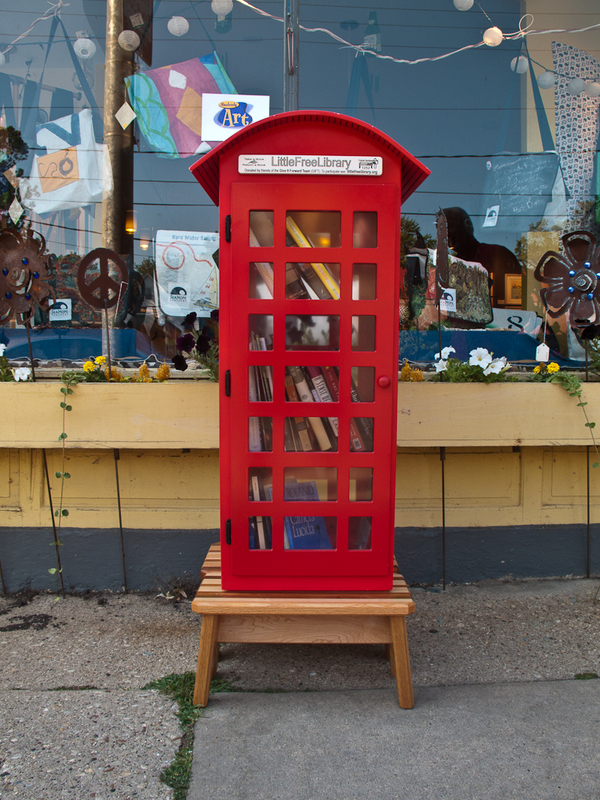 He showed us little libraries for sale and a few in place on the streets of Madison. Later, we walked over to the house of a wood worker named Eric who showed us a modular design for Little Free Libraries that could be easily shipped. Eric’s wife gave us ice-cold lemonade that was greatly appreciated on this warm evening. We ended the evening having dinner with Greg Conniff, his wife and a neighbor named Andy Adams. Greg was one of the original Water in the West project members. He is whip-smart and one of the best photographers that I know. He spent his Guggenheim Fellowship time photographing in Mississippi and we see some of this stunning work on his walls. 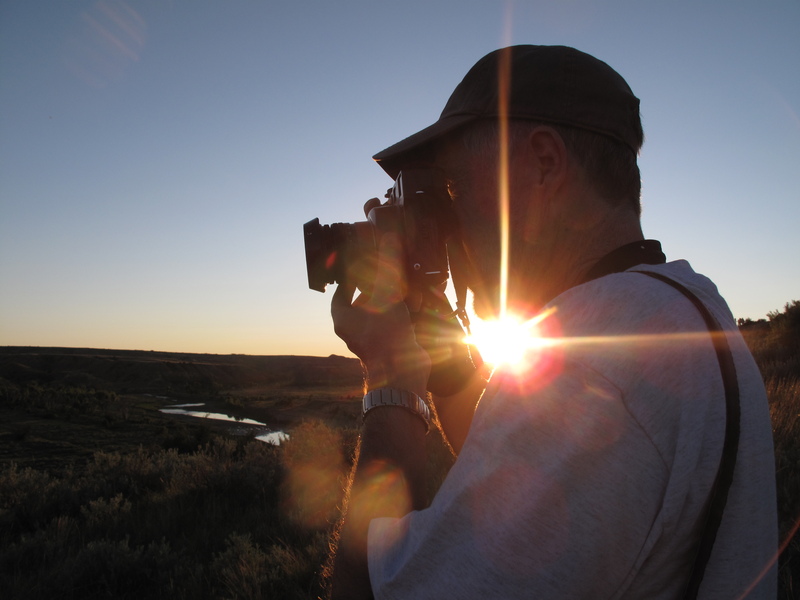 Andy was a 32 year-old blogger who had an interest in photography, landscape and the internet. The topics of our high-octane conversation included the recent recall-Governor Walker election, Mississippi, Water in the West, music and life-in-general. The margaritas and the home cooked food were excellent. 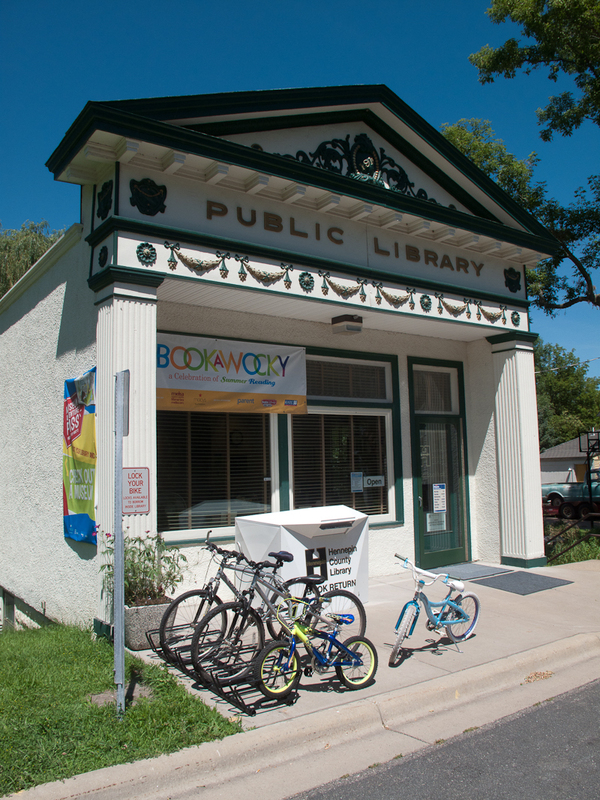 6/28/12 – After a quick stop to photograph the unusual library in Fennimore, WI we entered Iowa at Dubuque. The Carnegie-Stout Library there was one of the last that Carnegie built in the US. Greek classical ideas were all over the exterior of this beautiful building. The interior had been nicely renovated and the friendly librarians were delighted to show me around. While I photographed, Walker scoped out Dubuque. The130 year-old vertical tramway traversed the steep hills of this Mississippi River town. The beautiful old brick architecture and the verticality of the city reminded us a little of Duluth. 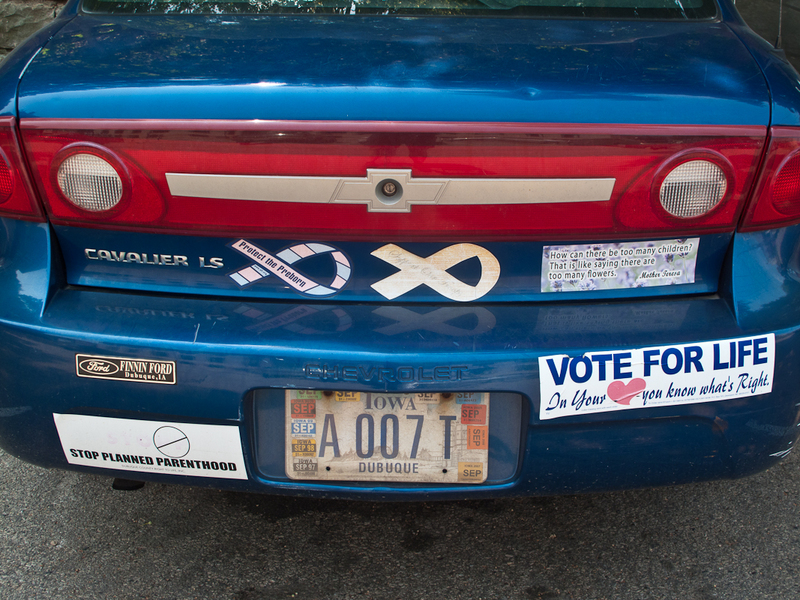 As I packed up my camera I noticed a parked car with many anti-abortion bumper stickers reminding us of another part of this otherwise delightful town. We spent the rest of the day driving through the rolling hills of the beautiful Iowa corn belt. As we listened to the radio we alternated between NPR and Rush Limbaugh. The surprising Supreme Court decision on the Health Care Reform Law had the radio station all abuzz with the news. The tone of the coverage was fascinating. The NPR commentators sounded calm and rational while Fox Radio’s Rush Limbaugh was hyperventilating on air about what a disaster this was. It was especially interesting to hear him target the Supremes Chief Justice John Roberts as a traitor to the cause. This divide that we heard on the radio reflected the divide in our country that was being played out in this battleground state of Iowa. 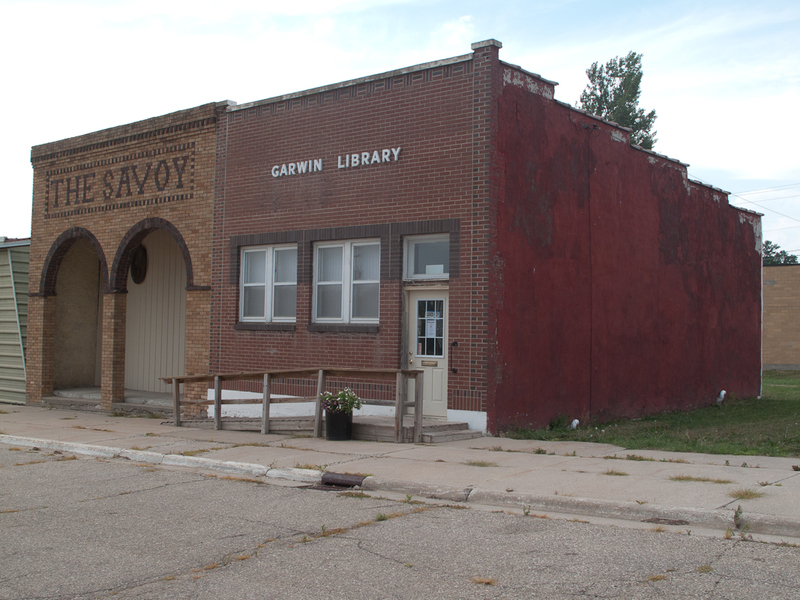 The small farming communities of Coggin, Garwin and Chelsea all forced me to rethink my approach to photographing libraries in rural Iowa. These mostly stripped-down, no-nonsense buildings reflected the communities in which they existed. The proximity to large silos and grain elevators added a new element to my photos. Chelsea was the nicest looking of the three and I spent some time photographing in the sunset light. Before Chelsea we had driven down a dirt road through the Mesquake Indian Settlement , the only significant Indian community left in Iowa. This area is almost a secret and we only found it because of our map. We guessed that the large Casino on the highway helped make this Settlement seem relatively well off. After Chelsea we made a beeline to Iowa City. This area has the highest number of PhDs per capita in the country. 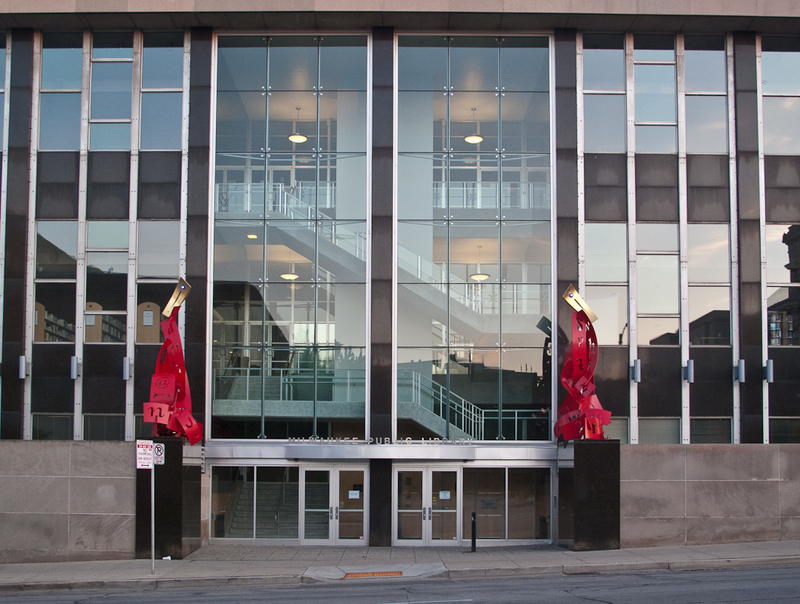 It is designated a “Literary City” by UNESCO because of its excellent University and the Iowa Writers Workshop. We had dinner at a great hipster, organic, locally sourced restaurant. My beer came from the nearby Amana Colony. Iowa was a delightful surprise! 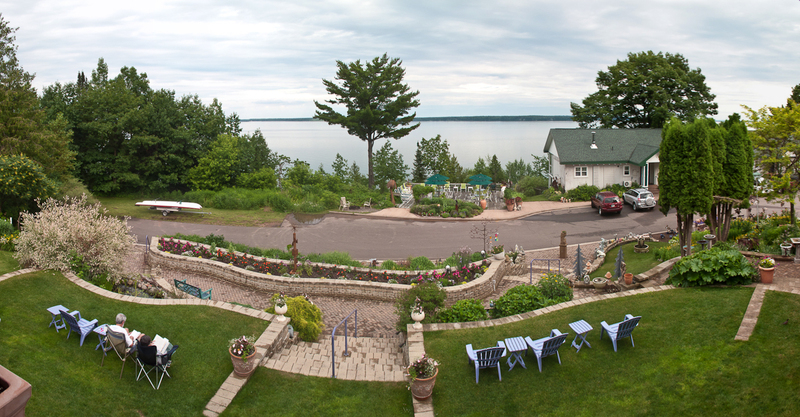 6/25/12 – Waking up at the crack-of-dawn we take the 7:30 ferry over to Madeline Island, part of the Apostle Islands in Lake Superior. 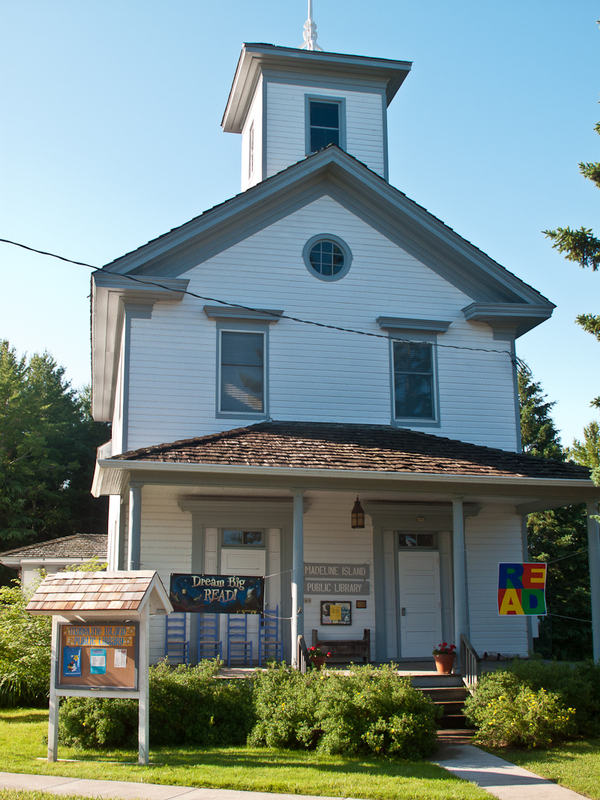 The library is in the little village of La Pointe, WI and is housed in a former schoolhouse. 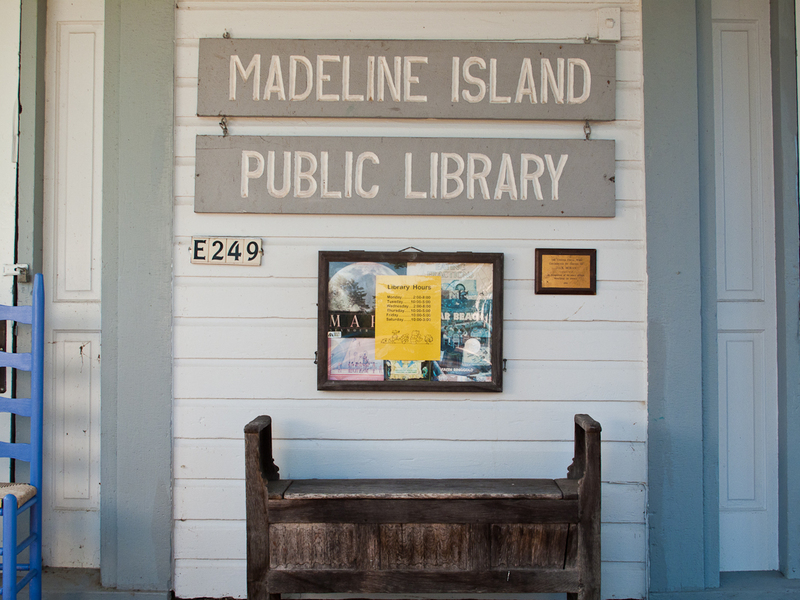 It is one of the cutest libraries on this trip and I enjoyed photographing it in the early morning light. Later, we walk into the local coffee shop and Walker taps me on the shoulder. “There’s Wanona La Duke “ he said nodding in the direction of an intense middle-aged woman sitting behind her lap top and talking on her cell phone. She ran twice for Vice President with Ralph Nader for the Green Party. She is a well known, Native American, environmental activist and now has a project that is part of Earth Island Institute where my wife Ellen has worked for years. She seemed pretty pre-occupied so we don’t introduce ourselves. I spoke with the café owner explaining our project and telling her that I regretted not being able to photograph the interior of the local library. With classic Wisconsin friendliness he said “We’ll fix that” and ran off to call the local librarian. Five minutes later the librarian showed up at the library with wet hair having just gotten out of the show. She gave us a wonderful tour of this amazing library. Small towns are great! After taking the ferry back to the mainland I quickly photographed the beautiful old Carnegie library on a hill in Bayfield, WI. We spent hours doing research looking for interesting libraries before the trip and it has really paid off. 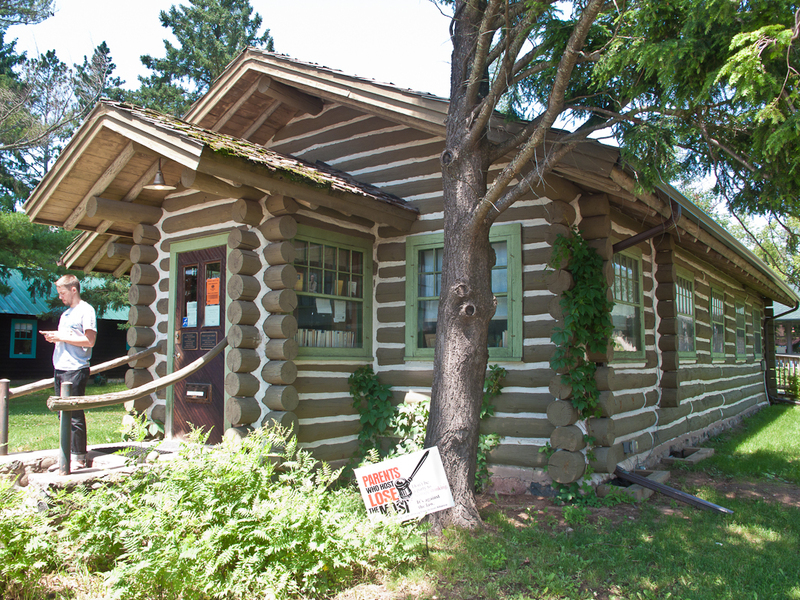 The Forest Lodge library Cable, WI is an example. It is a wonderful, early 20th century log cabin that is unique and thus important for this project. 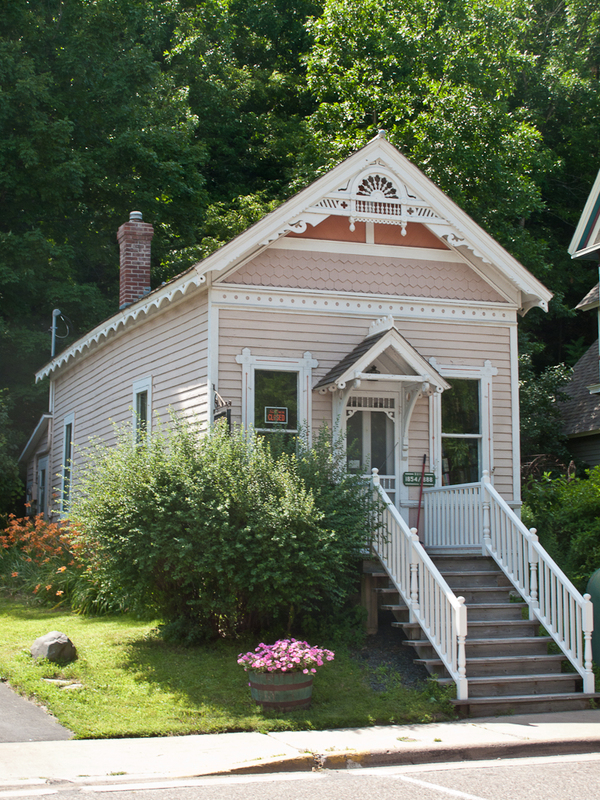 After quickly photographing a Victorian house/library in Taylor Falls, MN we drive into Minneapolis, MN to stay with our friends JoAnn Verburg and Jim Moore. Jo Ann is a brilliant photographer who worked with Ellen and Mark Klett on the Rephotographic Survey Project. 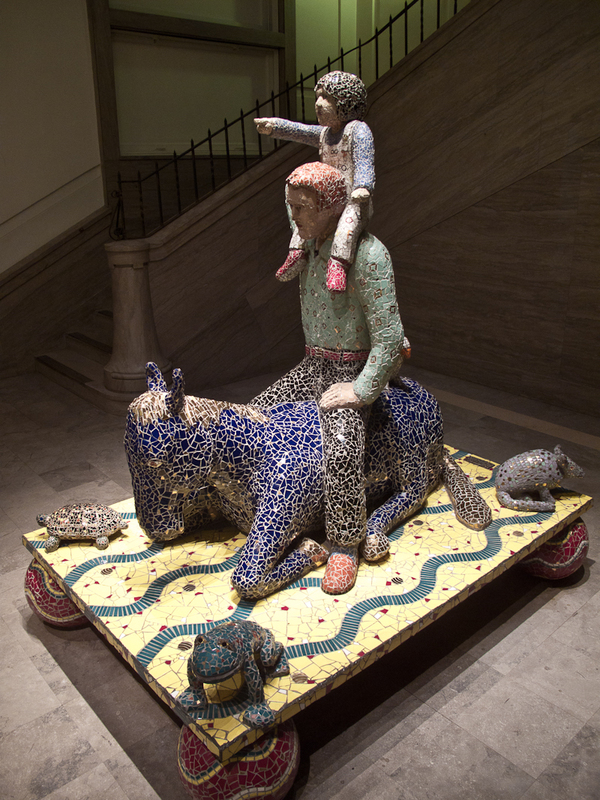 She recently had a one-person show of her work at MOMA in New York. Her husband Jim is a brilliant poet who recently received a Guggenheim Fellowship for his poetry. 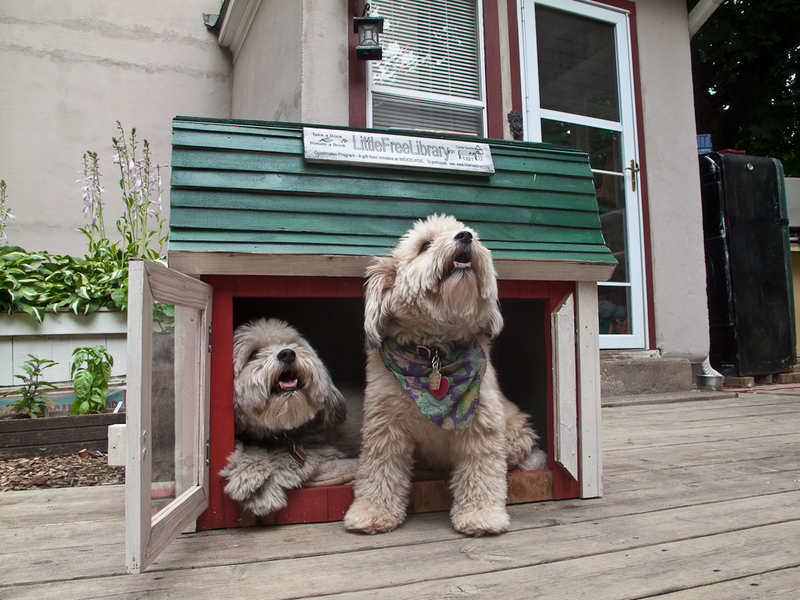 Their home is beautiful and is filled with art and books. 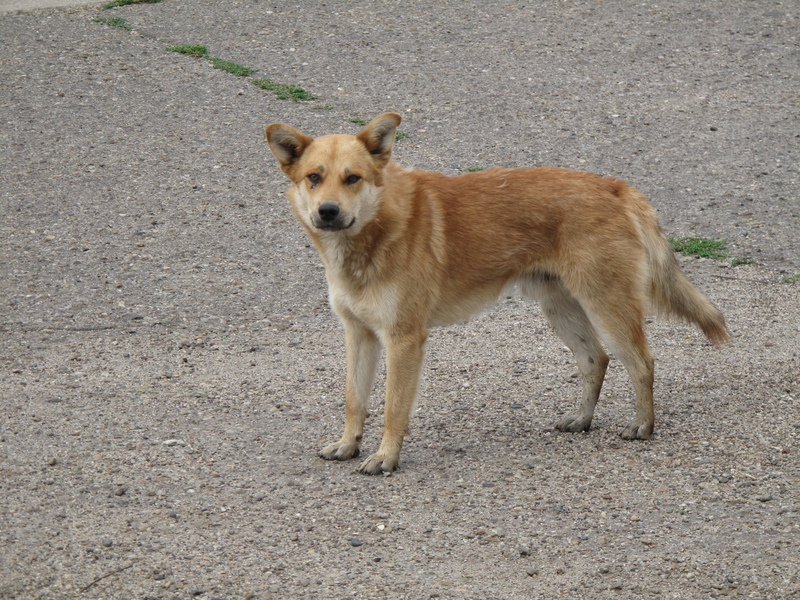 They live near the Gutherie Theater in an up and coming neighborhood. We feel right at home. JoAnn took us on a fascinating walk through downtown Minneapolis along the shores of the Mississippi River. I am intrigued to think that this river links Minneapolis – St. Paul with New Orleans. 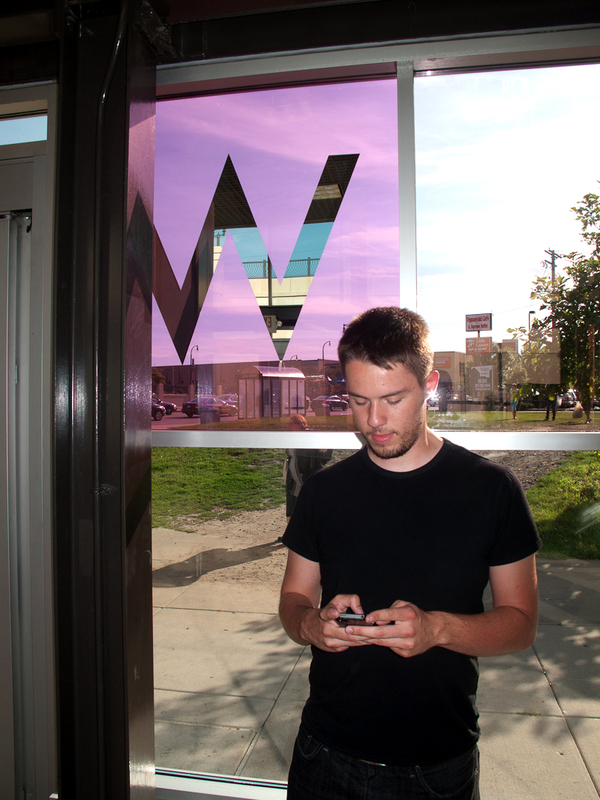 Walker felt that Minneapolis was more energetic, diverse, and grittier than he expected. The River is at full volume and during our nighttime walk makes an impressive sight with the beautiful skyline in the background. We will spend the much of the next week meandering down the mighty Mississippi. 6/25/12 – In the morning I brought JoAnn and Jim a pot of freshly brewed Martha & Bros. coffee from San Francisco. They are real coffee fanatics and I am happy to share what we consider the best coffee in the universe. JoAnn had taken us by the Central Library last night on our walk. Because of that I know to drive to the top of the nearby six-story garage to get the elevated shot of the library in the morning light. The building was very new and had a fantastic peaked roof and a beautiful atrium inside. I photographed a shelf of Minneapolis phone books from the 1950s and the ultra modern Teen Center. Minneapolis had a large Somali refugee community. 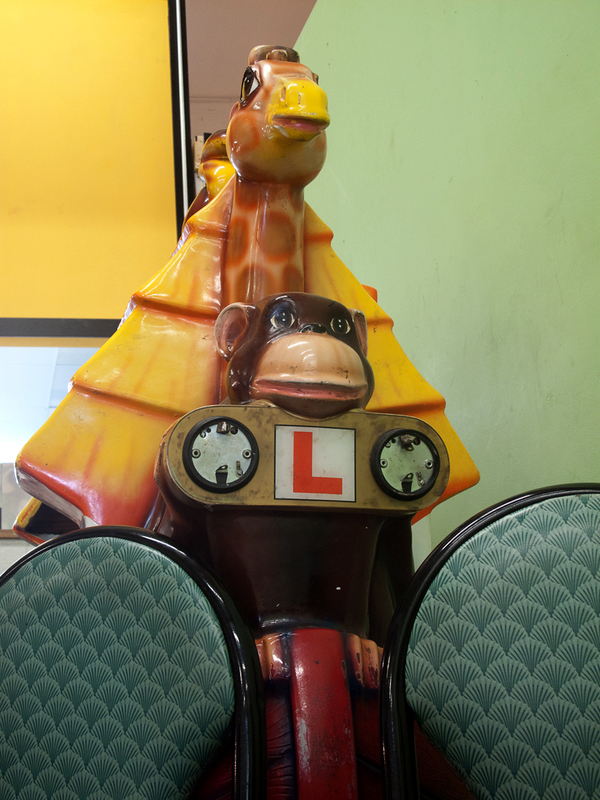 We had an excellent, spicy lunch at the Safari Express, a Somali café in a food court. It is located in a old Sears & Robuck building that housed many ethnic stores. This place reflects the new ethnic diversity of the area. The library in St. Bonefacius looked really good on Goggle Street View. After lunch we spent the next hour driving through endless suburban sprawl to get there. This is Michelle Bachman country and we got very tired driving through identical malls and subdivisions. St. Bonefacius used to be an isolated, rural community but now was the far western edge of metropolitan Minneapolis. 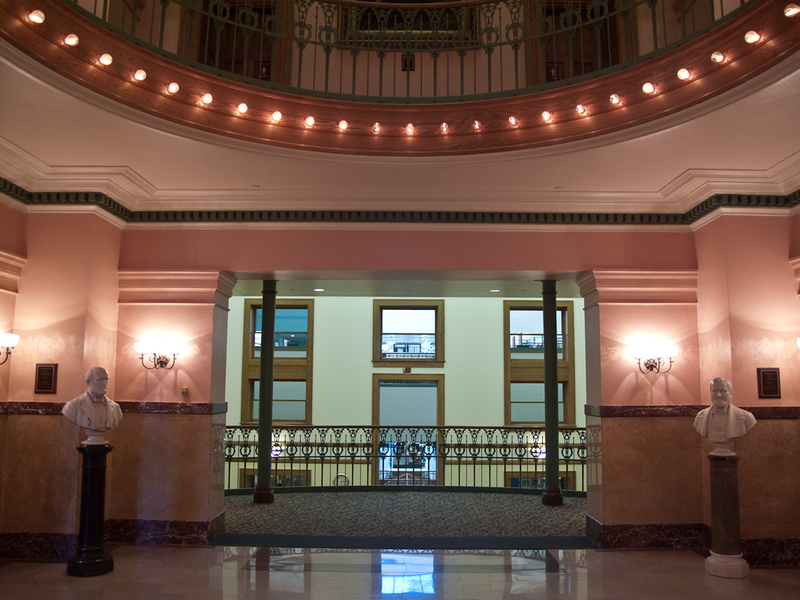 The library was beautiful and originally was a bank. After I spoke with the librarian I passed by a man who gave me a hand written note. It read “The Sacred Beatle (sp) or Scarab has been used by the Masons since Egyptian times. It is a symbol of new begging’s and fortune – Beatles (sp) are hatched at night & this is where we get the saying ‘It is Darkest Before the Dawn’.” After pondering this message I walked outside and found the molded Scarab (or “Beatle”) on the wall left by the Masons that built the original bank. We spent the hour drive back listening to “1491” and ignored the sprawl. We drove past Minneapolis into St. Paul to it old, massive Central Library downtown. For some reason not apparent to me the inside had been chopped up into little rooms. In spite of the large size of the library the general impression was claustrophobic rather than grand. To end our visit to St. Paul we drove past the impressive Capitol building and went to Lonely Planet’s highest recommendation for this city – the Hmong Marketplace. Like the Somalis that we saw earlier the Hmong had escaped violence and oppression in their homeland of Laos and Vietnam. Here and in the San Joaquin Valley in California are the largest concentrations of Hmong outside of Southeast Asia. We had flavored bubble tea and toured the fascinating Marketplace. Old men sat around swapping stories and watching videos about the homeland. We saw Somali women wearing colorful East African dress and headscarves shopping among the Hmong. Little plastic wrapped toy kits reinforced gender stereotypes. Pink doll kits for the girls and violent war toys for the boys. 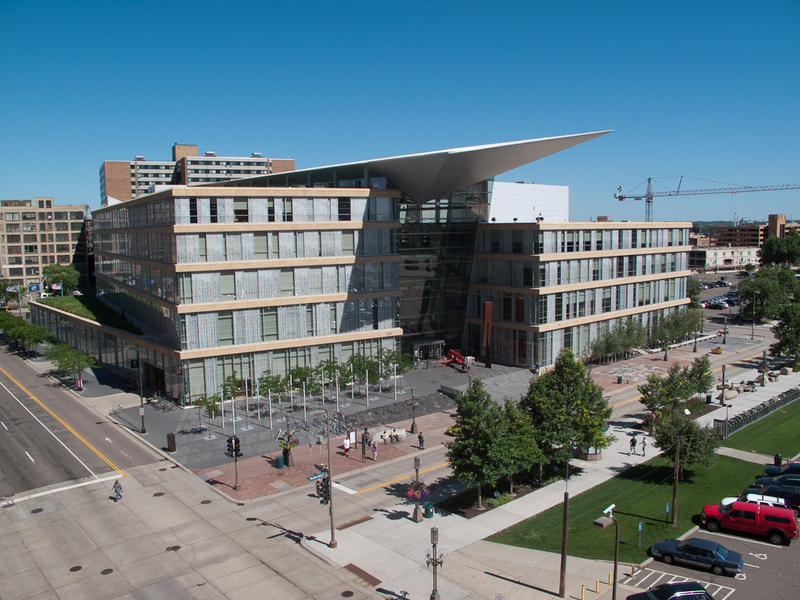 We left St. Paul driving back to Minneapolis along the wealthy, historic part of the city on Summit Avenue. Here was the home of F. Scott Fitzgerald and old money. 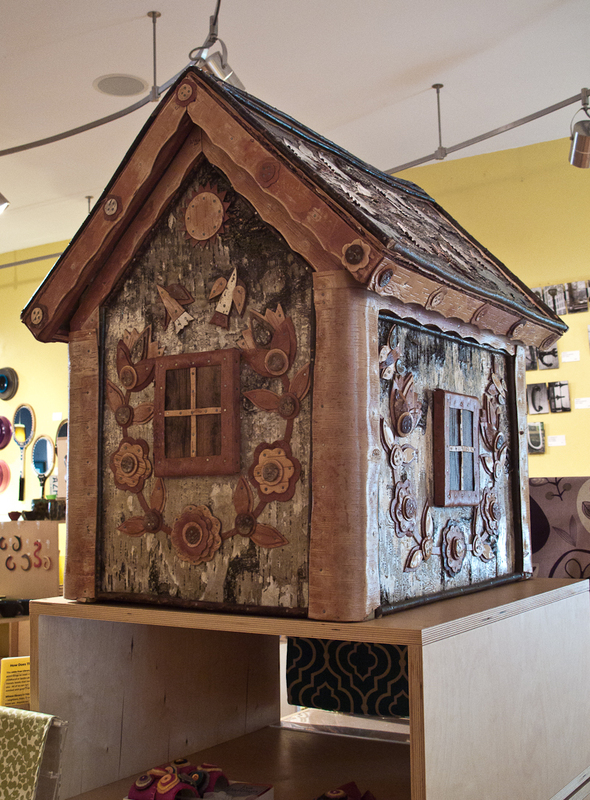 The complex relationship between the Twin Cities fascinated us. Finally, we quickly visited JoAnn’s beautiful but subtle public art piece in a train stop located in a Native American neighborhood. We ended the day having a great dinner with JoAnn and Jim. Walker and both hope to come back as soon as possible to this great and welcoming place. 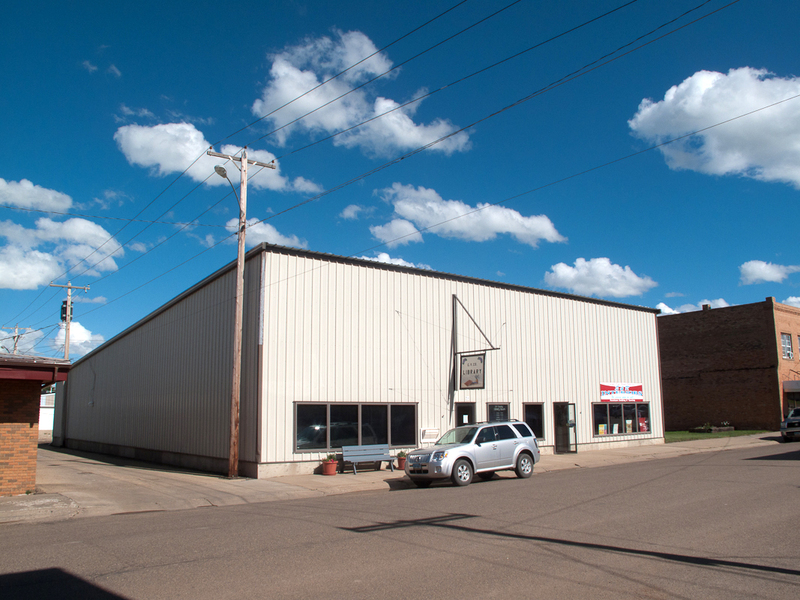 6/23/12 – Mahnomen, MN is a 35% Indian town in the poorest county in Minnesota. 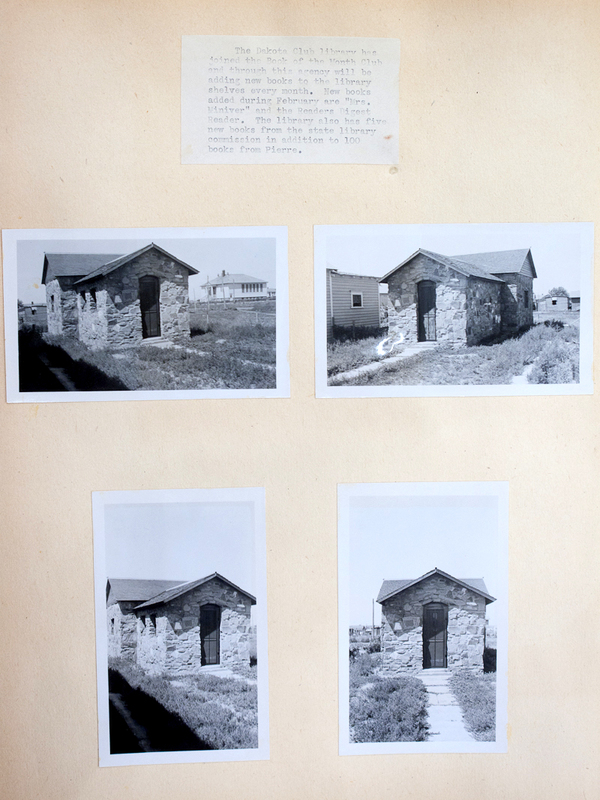 It has a fascinating rock-walled library built by the WPA in the 1930s. The friendly librarian was (as usual) a font of information about the community. She even showed me a very good book on the libraries of Minnesota. 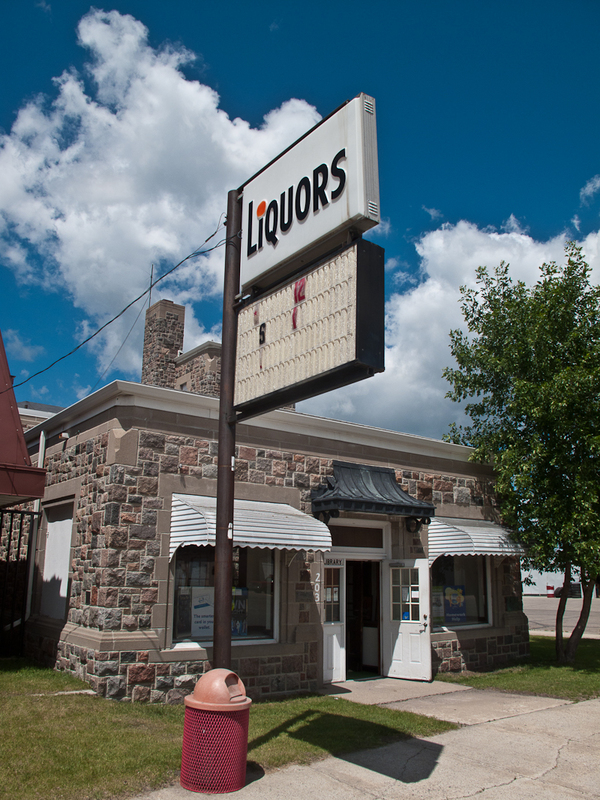 Walker pointed out what was the best view of a giant liquor sign near the front of the library. It was especially troubling given the problem of alcoholism in some Indian communities. 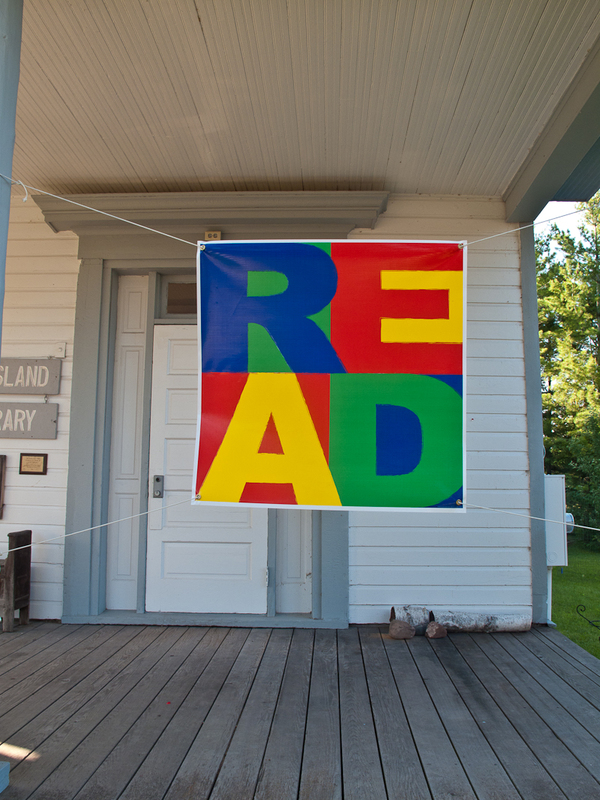 Another great library was in the majority Indian town of Cass Lake, MN. It is one of the poorest towns in the state. 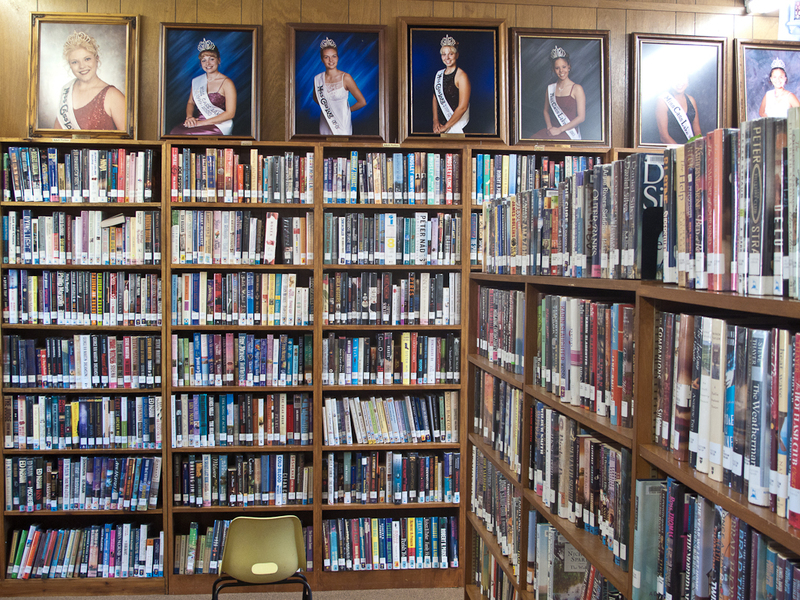 The library was also made out of rocks and featured portraits of all the Miss Cass Lake winners, both white and Native. 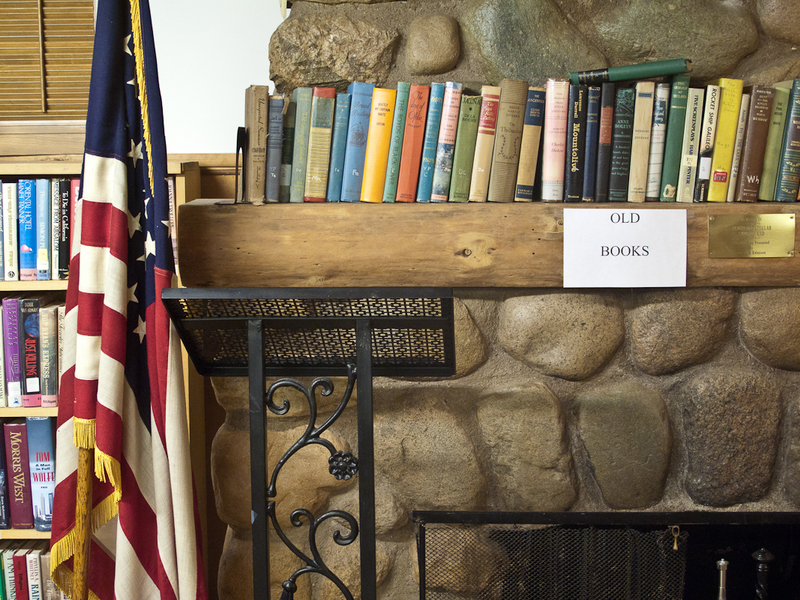 The basement functioned as a meeting room and had a wonderful rock fireplace, an American flag and “old books”. Again, the librarian was very helpful and helped in explaining the story of this town. Coleraine’s beautiful, yellow Carnegie was supposedly the best preserved Carnegie in the US. It was closed on this day and the town was very quiet. We were very excited about going to Hibbing, MN, home of Bob Dylan. 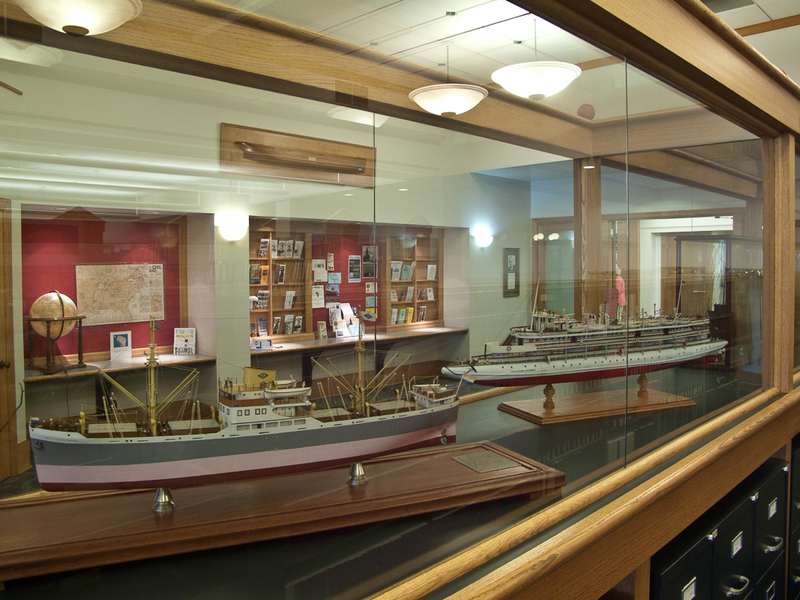 Walker had read in Lonely Planet that the town’s library had a notable display on Dylan’s young life here. Unfortunately, when we got here the library was closed and most everything in the town was too. It struck me that many of the hometowns of famous writers, artists and musicians that we have (or will) visit are often tough, working –class places. Jack Kerouac of Lowell, MA; Samuel Clemens of Hannibal, MO; and Bob Dylan of Hibbing, MN all transcended the limitations of their homes to become world famous figures in their fields. I can see why Dylan left Hibbing. Was there something about this backwater, down on its luck, Minnesota town that pushed him into greatest? Do sad, soulful places sometimes encourage genius? Chilsholm was another North Country town that had seen better days. Its unusual brick library was backlit but from the side had just enough light to be interesting. 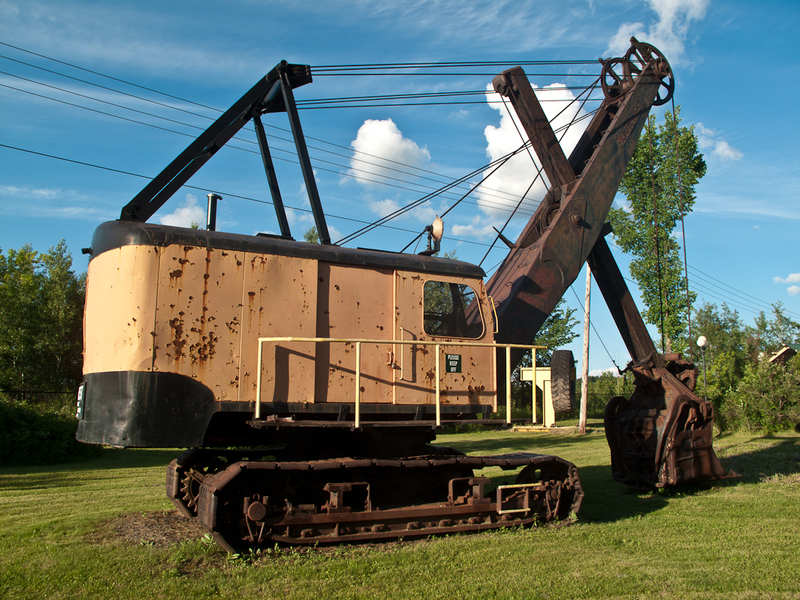 Mountain Iron, MN was the center of the world’s largest deposit of iron ore. Mining that ore was one of the reasons that the United States did so well in World War II. This ore, used in the making of steel, gave us a great advantage over other nations at the time. The world’s largest open pit mine is right here. The Carnegie Library here was spectacular with monuments in front to the glory days of this now faded, working-class town. Images from the movie Deerhunter came to mind. We peeked into the still functioning mine and saw an open pit that stretched beyond the horizon. After a brief stop at the library in Eveleth, MN we drove on to Duluth, MN. This city has one of the most beautiful entrances we had ever seen. We both gasped as we steeply descended into this hilly city by Lake Superior. The sunset was magical. We both fell in love with this place as we walked over to the lake that looked like a sea. At dinner, our waitress called it the “San Francisco of the mid-West”. 6/24/12 – This morning we woke up to a steady rain. This area had been hammered by a huge storm just two days ago and we saw some of the damage as we drove around town. The downtown seemed pretty seedy with shady characters mixed in with rest of the people on the street. At Jitters Coffee Shop Walker renamed this city the more appropriate “Pittsburgh-by-the-Bay. We were still fascinated by this place but realized that Pittsburgh was a better comparison for Duluth than San Francisco. The Main Library here was ultra modern and closed on Saturday. It’s sleek lines were a great contrast with a French chateau style building on one side and a weird 1970’s housing complex on the other. While Walker was in the car I set up the 4X5 camera. While I was focusing on the library under the dark cloth I sensed someone standing close to me. I turned and found a very agitated African American woman standing three feet away with a red cell phone in my face screaming at me. She demanded to know why was I taking her picture. No reasoning would calm her down. She sobbed about her abusive boyfriend and her missing children and then swung her cell-phone camera back to my face like a weapon. What is it about photography that scares paranoid people like her? Why does this stuff keep happening to me? I thought back to being socked in the jaw last summer by another whack-job in Pittsburgh. I began to realize that Duluth and Pittsburgh really do have some things in common. The only other library we photographed today was the Bad River Tribal Library in Odanah, WI. It too was closed but I was able to take some photos through the window. 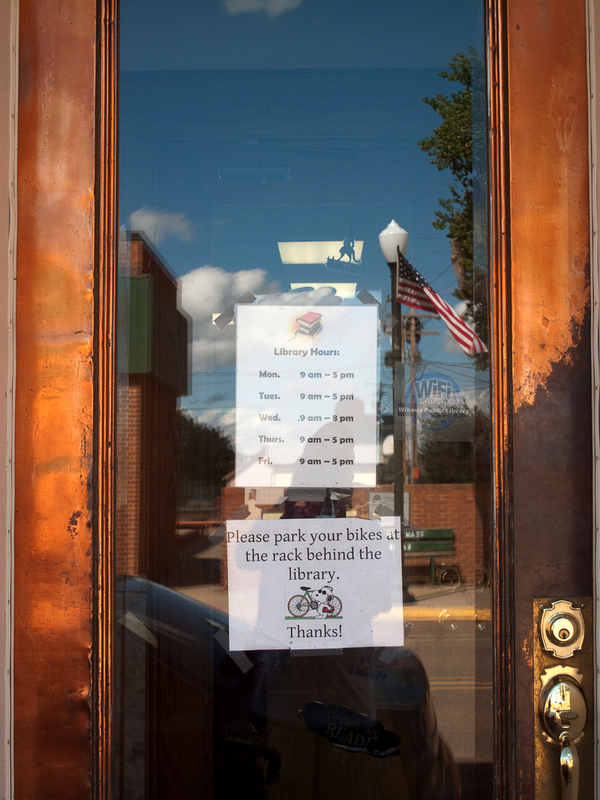 One sign inside read “Indian Parking – All Others Need a Reservation.” We end our day in the delightful town of Bayfield, WI. 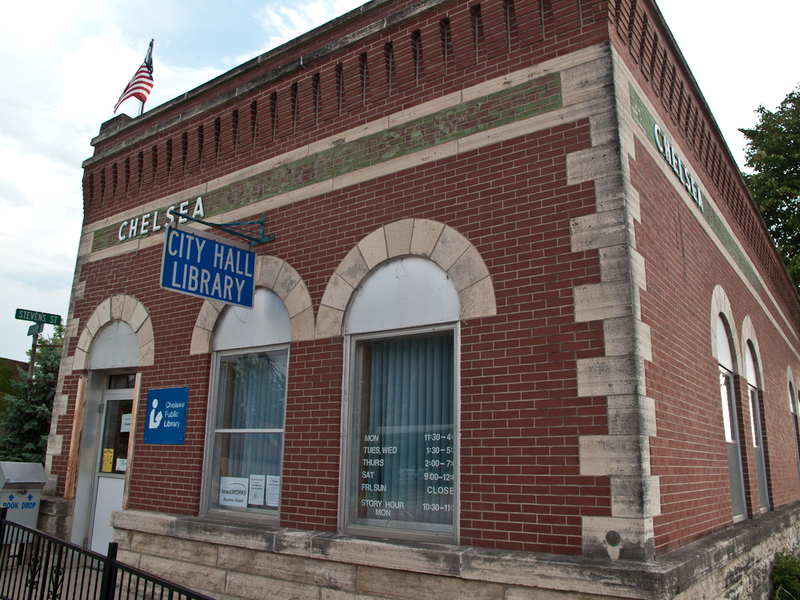 It was selected as the Best Small Town in the Mid West for 1997 by the Chicago Tribune. We agreed. After a great dinner in a local café we hiked down an overgrown and unused trail to the shore of Lake Superior. Mist from the Lake mixed with the red clouds of the sunset. All was quiet and peaceful. This was the first time that we could truly relax after spending a week on the road. 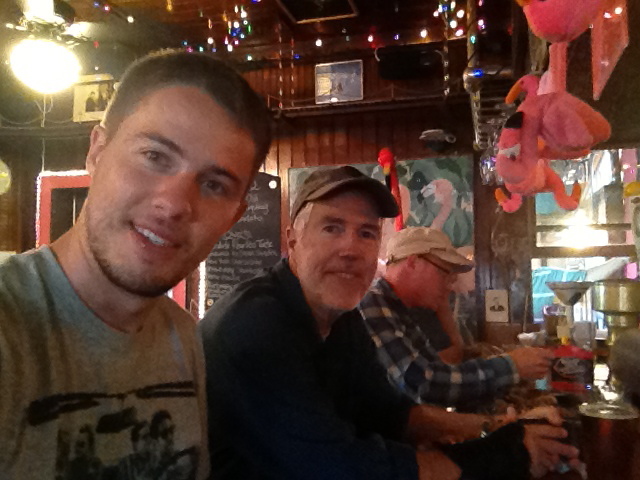 6/22/12 – One of the great things about traveling are the unexpected encounters with strangers. In a café in Mobridge overlooking the Missouri River we overheard an older white couple talking with their Indian waitress. 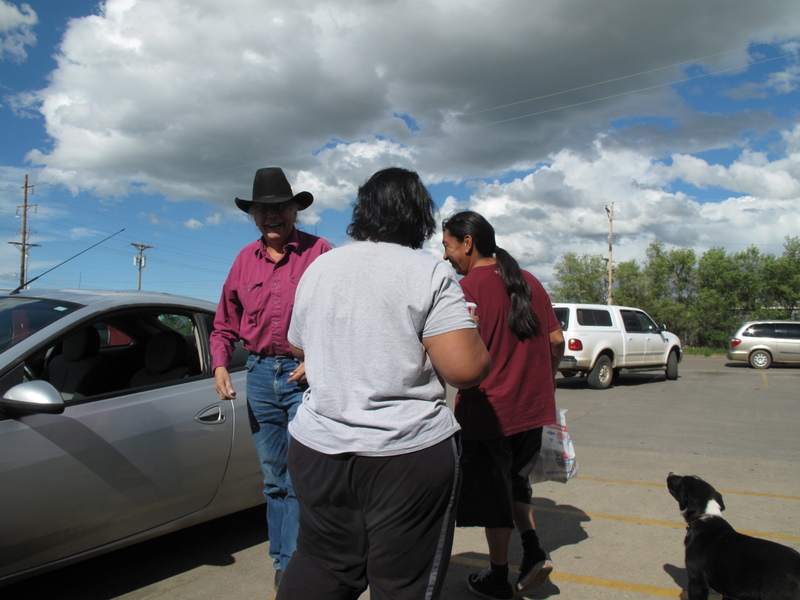 Their interest in history and Native culture immediately drew my attention and I went over and introduced myself. It turned out the he was raised in our neighborhood of Noe Vallley in San Francisco and grew up with the famous musician Carlos Santana. Small world! 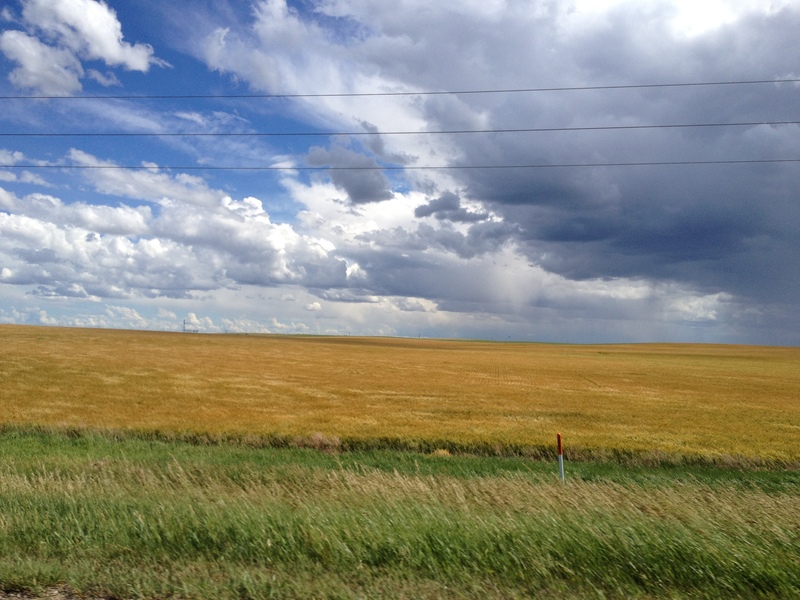 Today’s travel took us mostly to small towns in the eastern part of both South and North Dakota. We began to see the difference between the Dakotas is almost more between the east and west rather than the north and south. The unique A.H. Brown Library in Mobridge was just beginning the construction of a new addition. 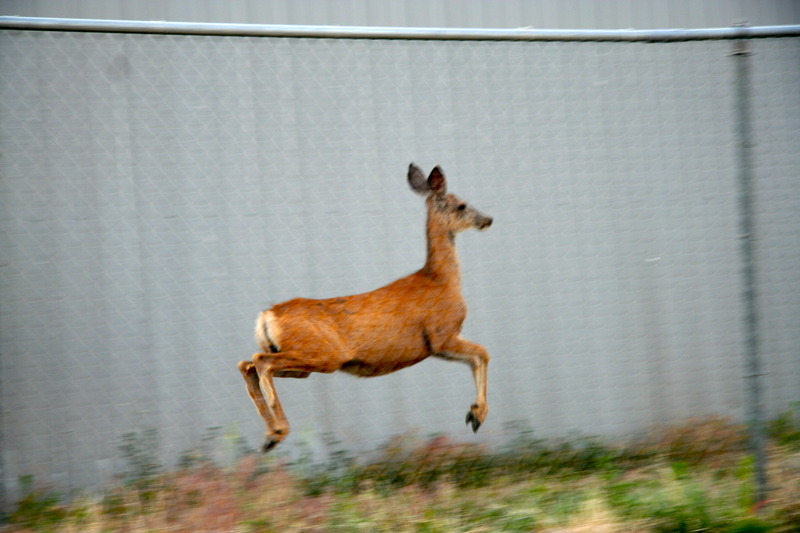 We had scoped it out the night before so I was able to quickly photograph and then move on. 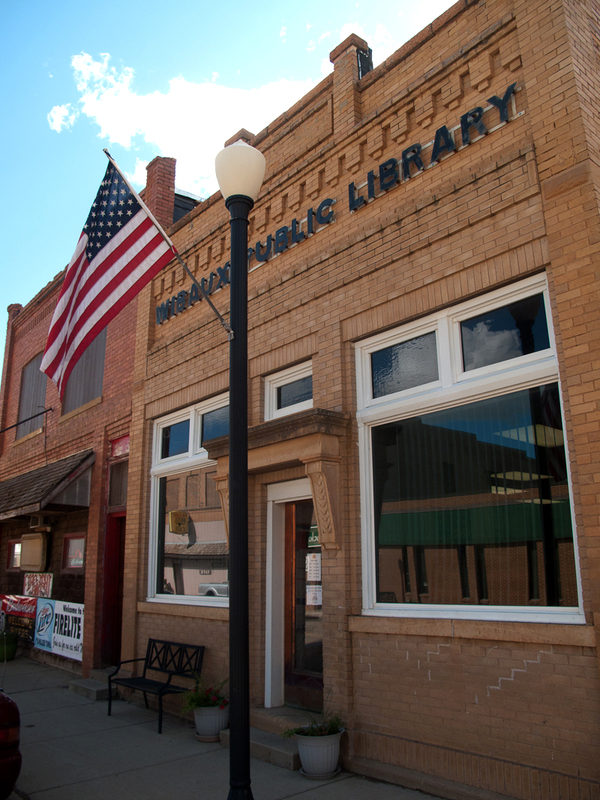 One of the best libraries on the trip so far was in Roscoe, SD. It was started in 1932 by a small group of local women (where have I heard this before?). The group called themselves the Priscilla Embroidery Club and they built the library because they wanted to “do something worthwhile”. 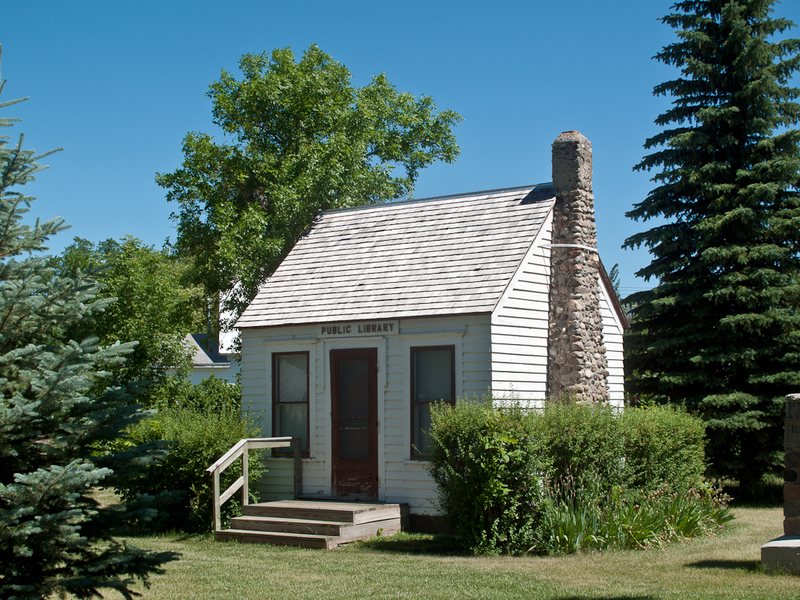 This one-room public library claimed to be the smallest in the country. It closed in 2002. Through several phone calls we were eventually able to find someone to open it up. The inside was musty, tiny and dark but contained the town’s collective memory including local newspapers from the early 20th century all carefully bound with string. I could se that the papers were fading and eventually this part of Roscoe’s history will be gone. 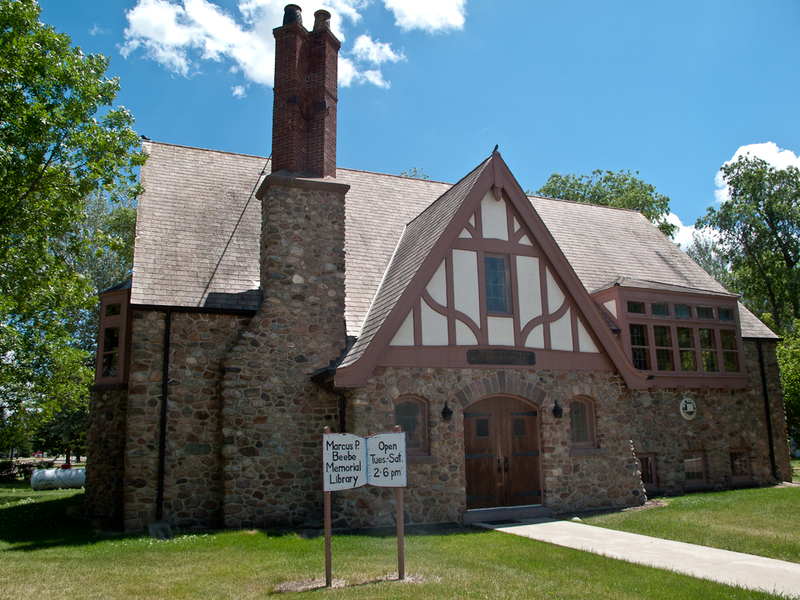 Ipswich, SD has the wonderful Tutor style Marcus P. Beebe Memorial Library. This was a surprise in such a small, rural town far from any large urban area. Our primary destination in this area was Redfield, SD. 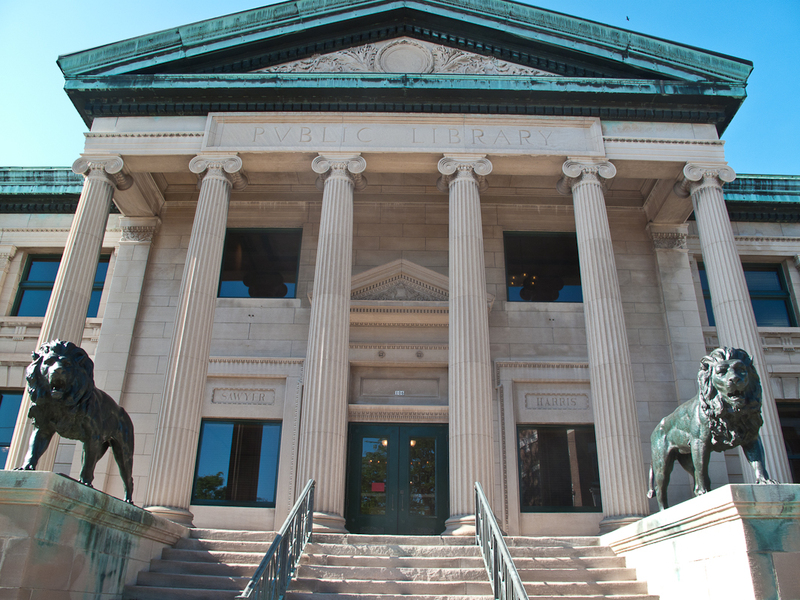 It had an unusually beautiful Carnegie library. As I was setting up my 4X5 camera outside, the former Mayor of Redfield stopped his car on the street next to me and told me the story of building the addition to the library. He was proud of making that happen and I told him that he should be proud. 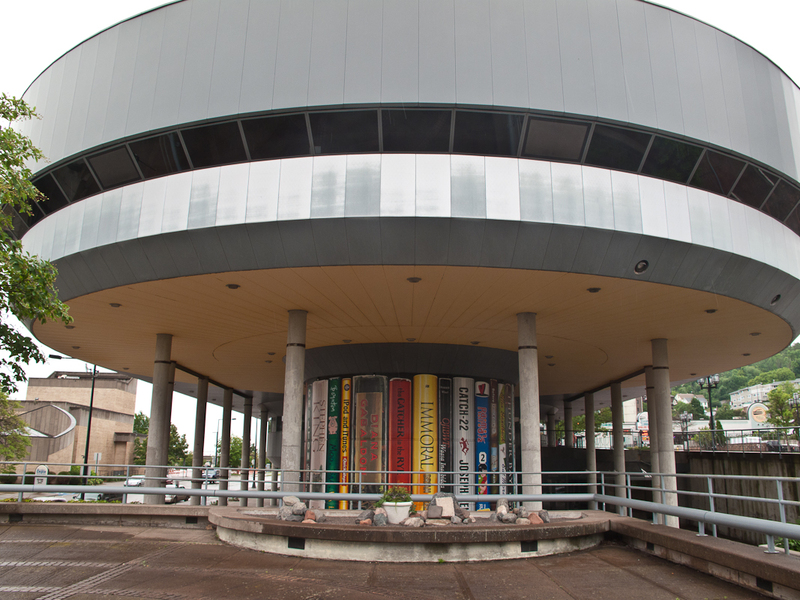 Often, additions to old libraries do harm to the architectural integrity of the original building. 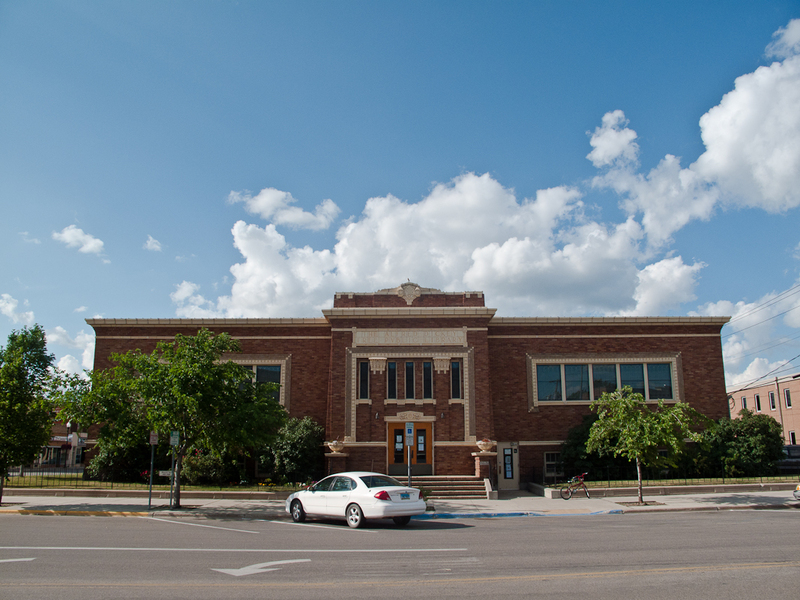 The addition to the Miles City Carnegie Library is an example. 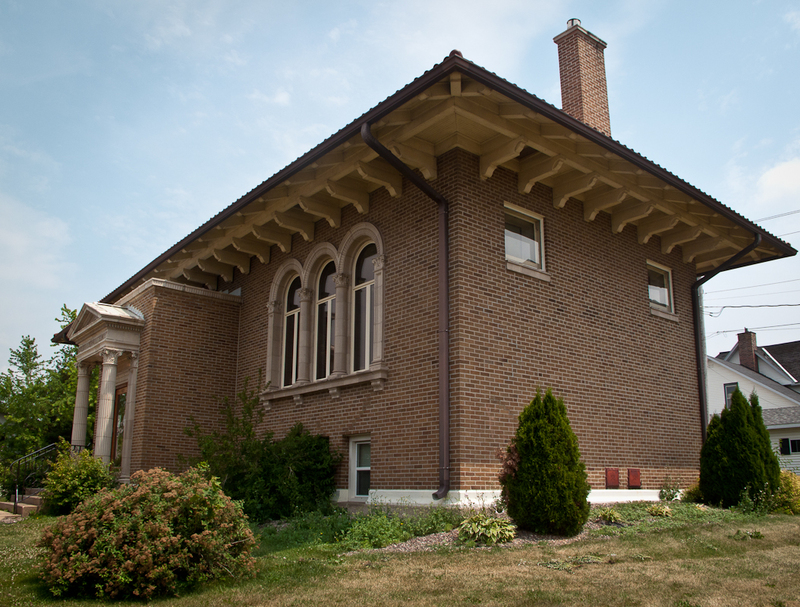 The addition to the Redfield Carnegie added much needed space but was sensitive to the Carnegie Library design. From here we drove straight north to Jamestown, ND and then east to Valley City, ND. 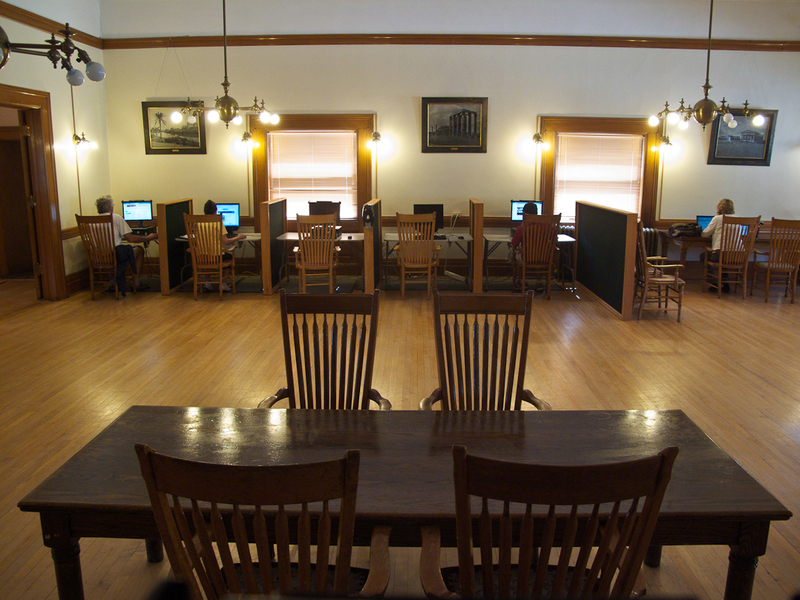 Both had remarkable old libraries and we again were surprised to find such elegant and impressive libraries in these small North Dakota towns. 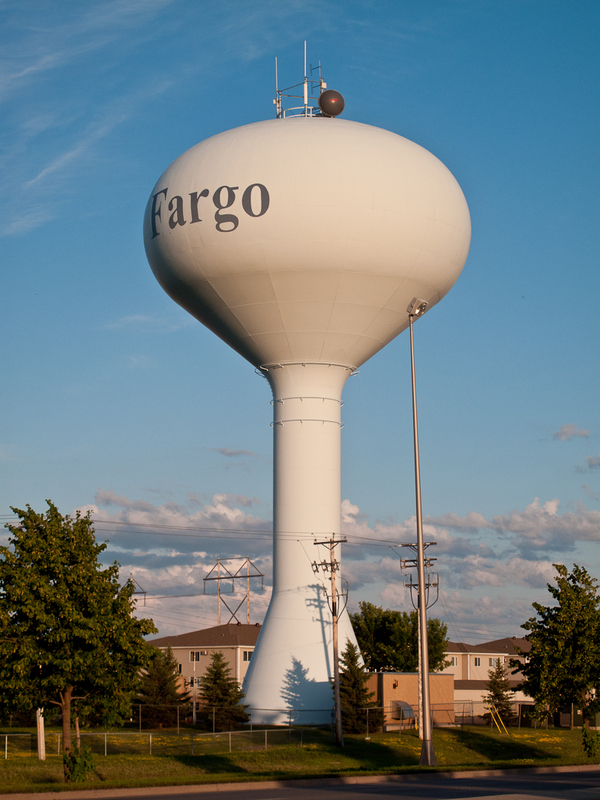 At the end of another long day we arrived in the eastern North Dakota town of Fargo. After quickly photographing the deco-themed West Fargo library Walker and I headed to the best Indian restaurant n the Fargo. And the only one as well. The owner was from Bombay and he and Walker got into an excited discussion about that incredible city. After dinner we rushed to the Main Library in Fargo. The library is modern and plain but the light from the building and the last light in the sky should make for some interesting photos. We checked in to our motel and I had to change film. As I sat in the darkened bathroom, I listened country western music, drank a beer and changed the 4X5 sheet film. After that I downloaded my digital photos onto my laptop. During the long drive today I wrote the blog for the previous day’s journey in longhand and later typed two day’s blogs on my laptop while Walker drove the car. Exhausted again, we both pass out into a deep sleep at 1 AM. Tomorrow we get up early and do it again. 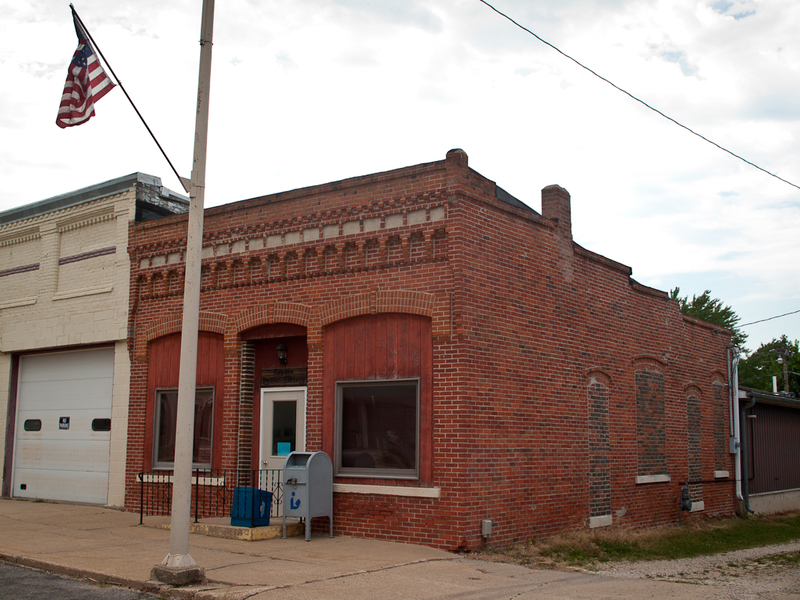 6/20/12 – Miles City surprised us. It was a wonderful little town with a lot of history. I even have some long lost relatives here. According to family lore the first pioneer child born in Montana was my ancestor Johnny Quinlan. Later, he either became a horse thief or a lawyer depending on which story you believe. 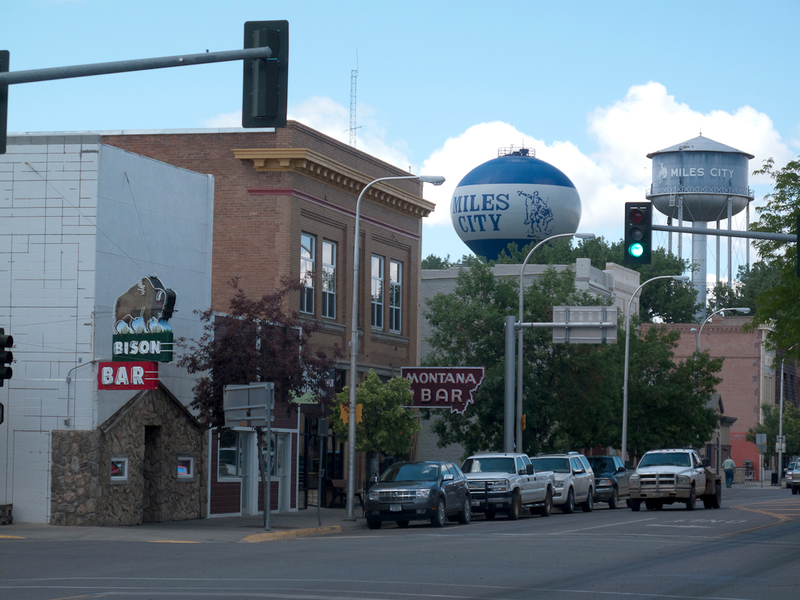 One branch of the family settled in Deer Lodge, MT where my mother was born and the other settled in Miles City. I kept scanning each new face hoping to see some familial connection. . The beautiful Carnegie Library here had a awful addition added almost completely obscuring the original. Even the red brick of the Carnegie was painted brown to match the addition. What were they thinking? The head librarian took me on a great tour showing their attempts at slowly stripping away the addition to reveal the hidden Carnegie library. She also showed me the amazing Montana Room with its stunning collection of L.A. Huffman photographs. Huffman was an excellent local photographer during the end of the frontier era. Several books have been produced on his work and the Montana Room displayed an impressive collection of his original photographs. 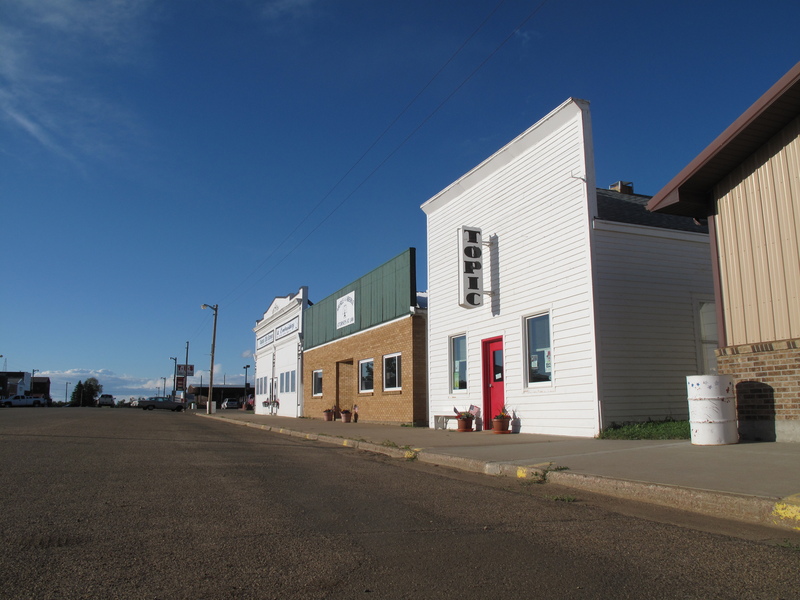 The tiny town of Terry, MT was also home to a famous photographer – Evelyn Cameron. She was a Montana pioneer from England who raised horses with her husband. To supplement their income she sold her photographs of the area to the local community. In doing so she created a fascinating record of the beginnings of Terry, MT and the final days of the settling of the American West. The library here was also tiny, austere and ultimately beautiful. 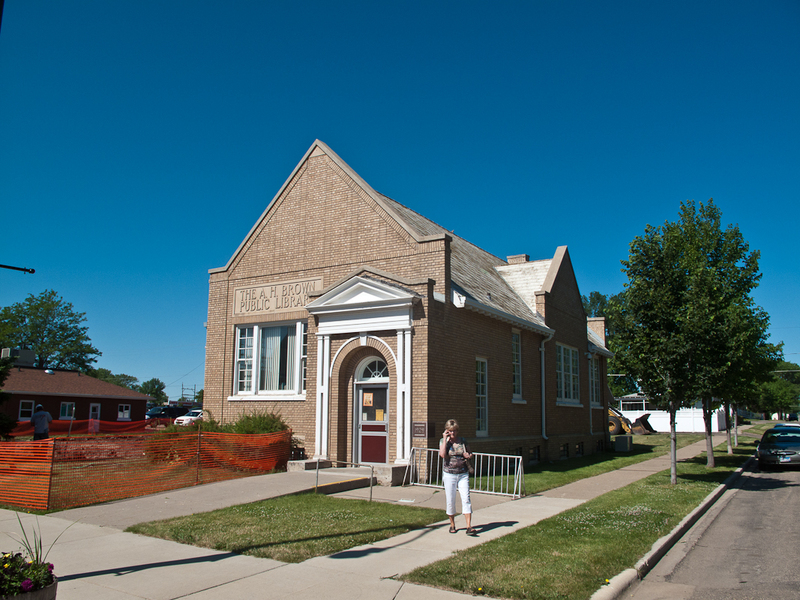 I think that the library in Glendive, MT used to be a bank with a drive up window. The Google Street View of it made me cringe. But the reality and its context were fascinating. 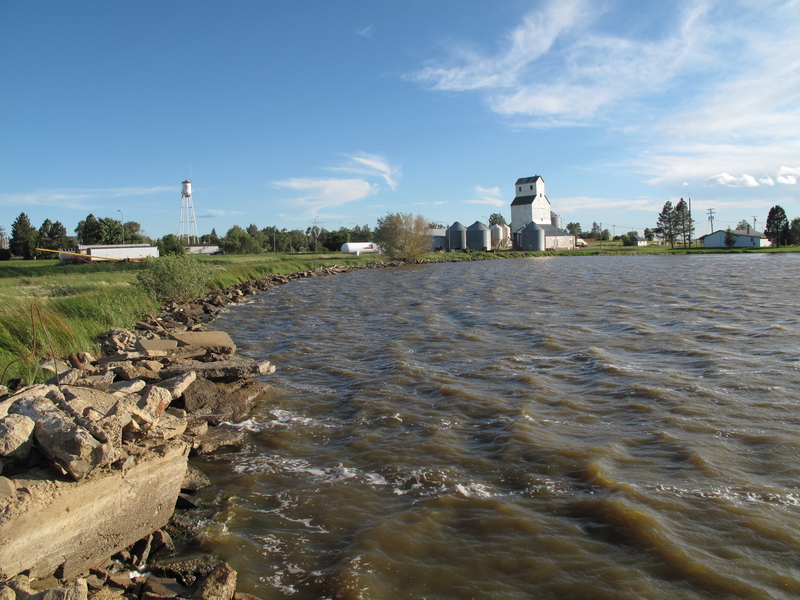 It had grain elevators in town, remnants of the frontier and also a Canadian feel to it due to the proximity to Canada. The Wiboux, MT library was old and beautiful but the lighting was not good. Just as I was turning to leave a young woman dressed in a punk/goth style stood in front of the library drinking a beer and smoking a cigarette. We talked for a while and her presence in the photo made for a great contrast between the old and new in Wiboux. Crossing into North Dakota we photographed the tiny town of Beach. Simple and beautiful would best describe it. 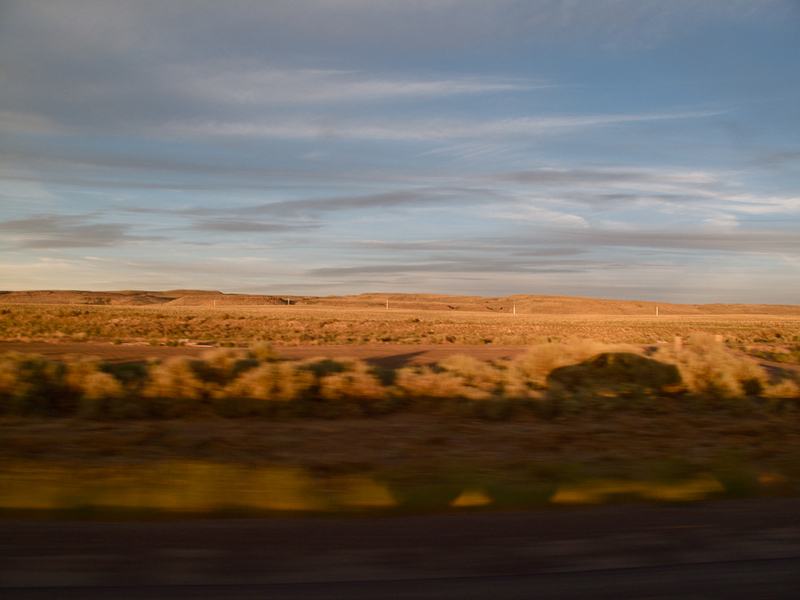 We stop at a truck stop and exult in the incredible open space all around us. 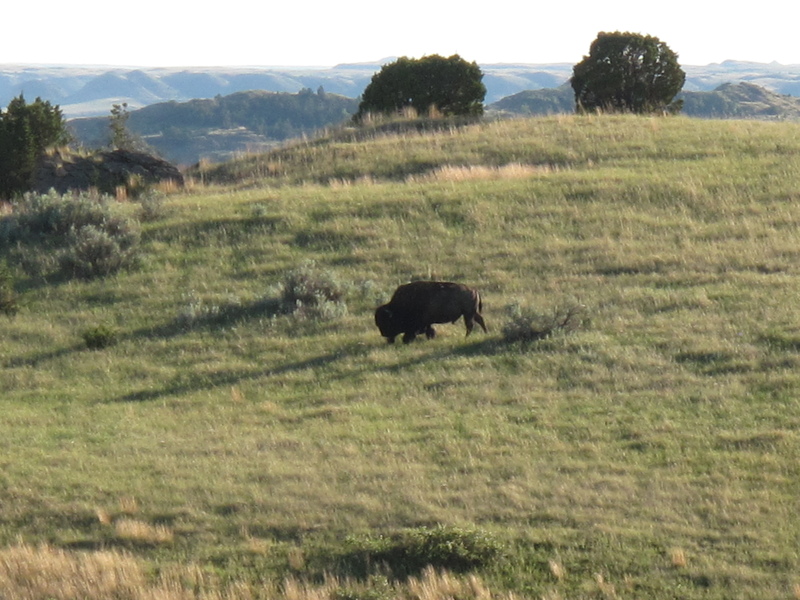 We finished the late afternoon and evening in Theodore Roosevelt National Park. 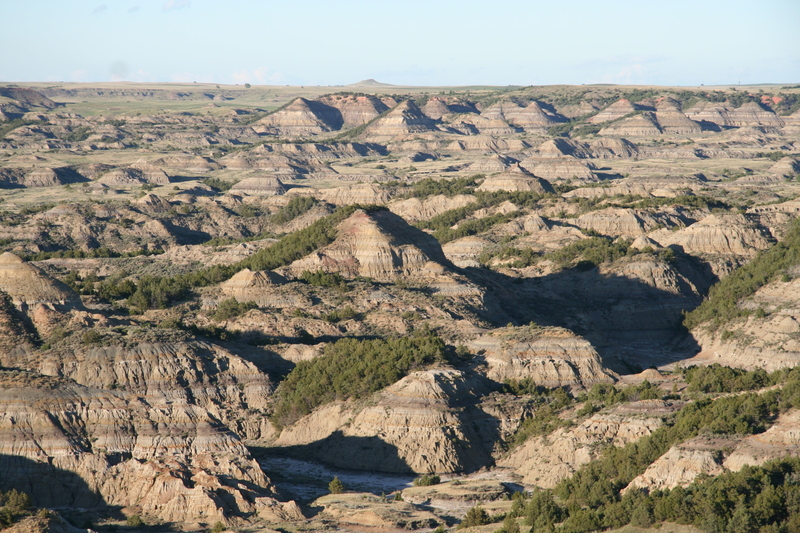 “ I never would have been President if it had not been for my experiences in North Dakota” Roosevelt said. His life here challenged this former New Yorker and sharpened his interests in nature and conservation. Later, he became one of the earliest Presidents to actively protect the environment by establishing several National Parks. This park is dedicated to his memory and his work. It is an overlooked national gem and we were overwhelmed by its beauty. As we drove and hiked through the park we were enveloped by this strange but fragile landscape. The perfect air, temperature and light instilled in us a sense of peaceful ease. After four days of hard charging we needed this. 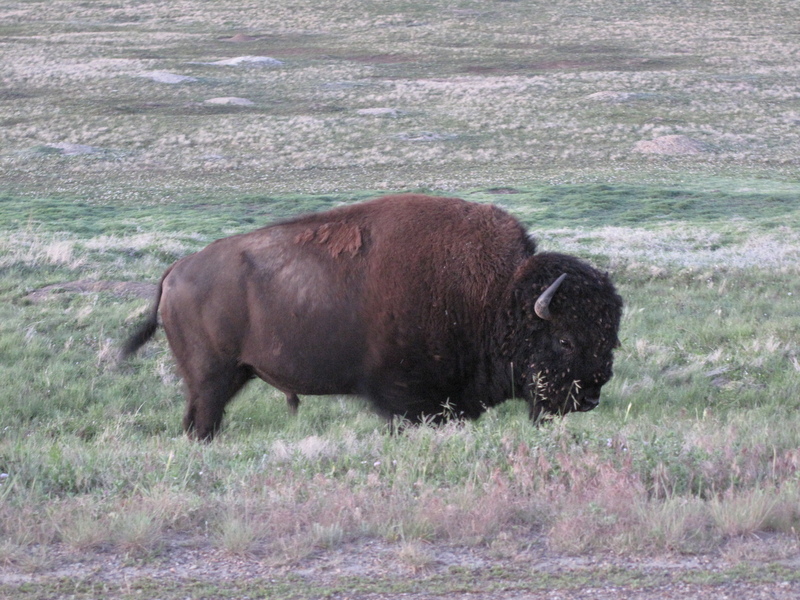 Frequently we encountered large, lumbering buffalo; small, perky Prairie Dogs and big-racked Elk. 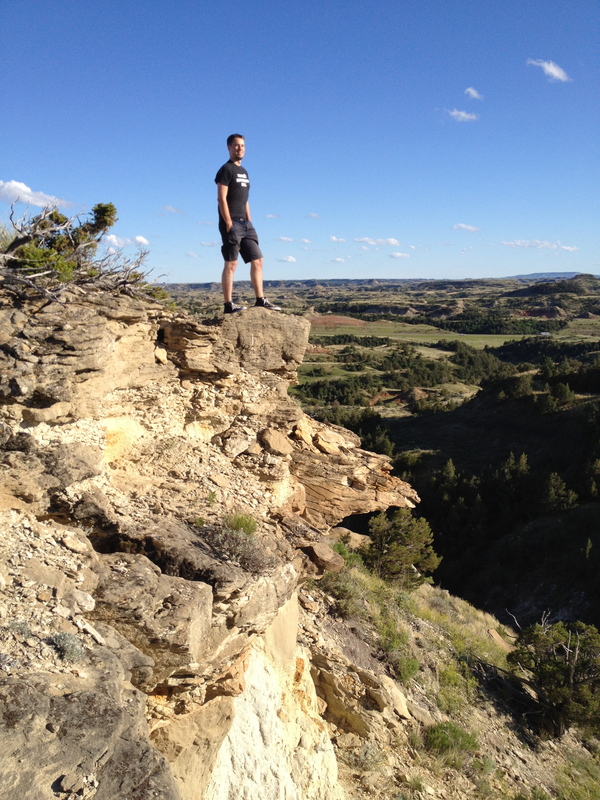 We hiked steep bluffs that gave us an impressive 360 degree view of the land and sky. At certain places we almost felt like we could fly off the steep ledge. 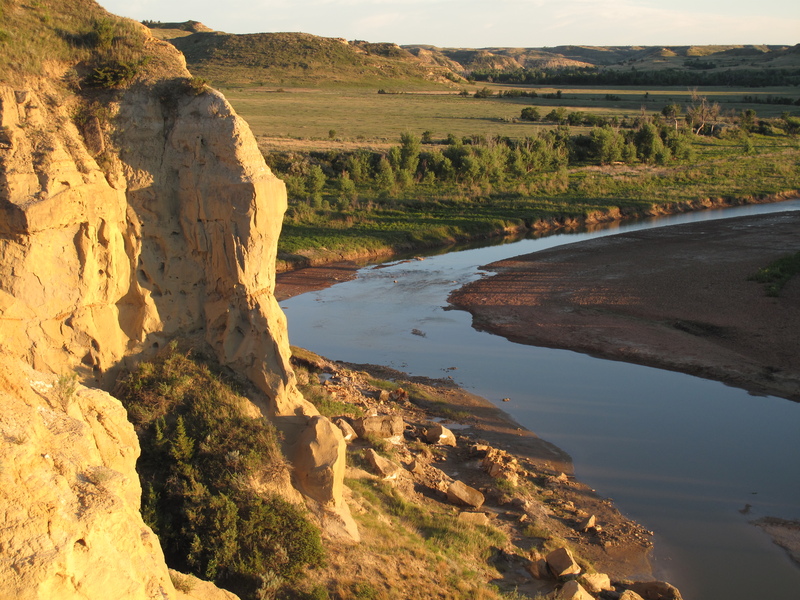 At the Wind Canyon overlook we watched the sun set over the sculpted cliffs and the Little Missouri River. As we looked down on buffalo tracks in the river we imagined dinosaurs walking through this timeless landscape. Later, we dined at the local bar in Medora. Our waitress was from China and another was from Russia. We had a long, fascinating conversation with the Russian about traveling, Putin and politics. This multi-national, college-aged work force is common in or near many American National Parks. Despite the sometime poor wages and working conditions the Russian woman had come here three times. Our conversation with her was one of the best we have had so far. 6/21/12 – It was a real struggle to get out of bed but we had miles to go. We passed the 2,000 mile mark near the tiny town of Amidon, ND. It takes pride in being the smallest county seat in the nation. 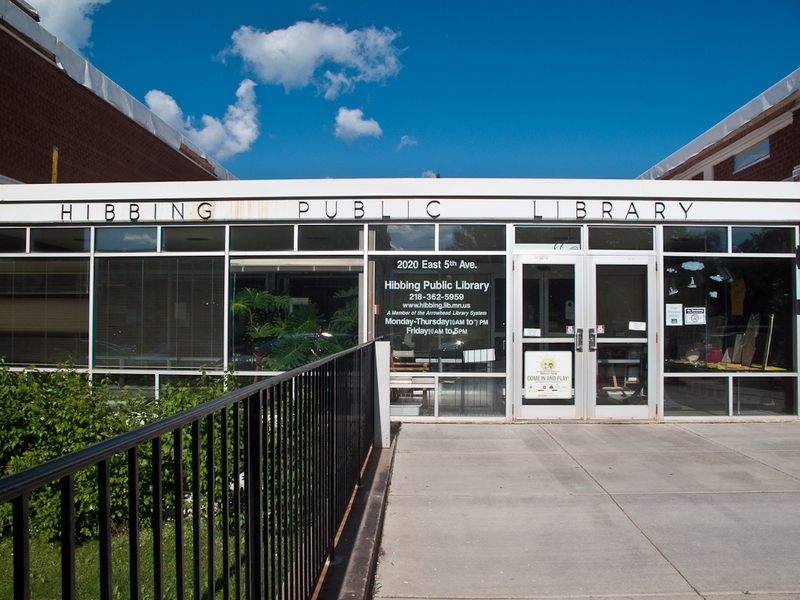 It also has the Prairie Library, now closed. 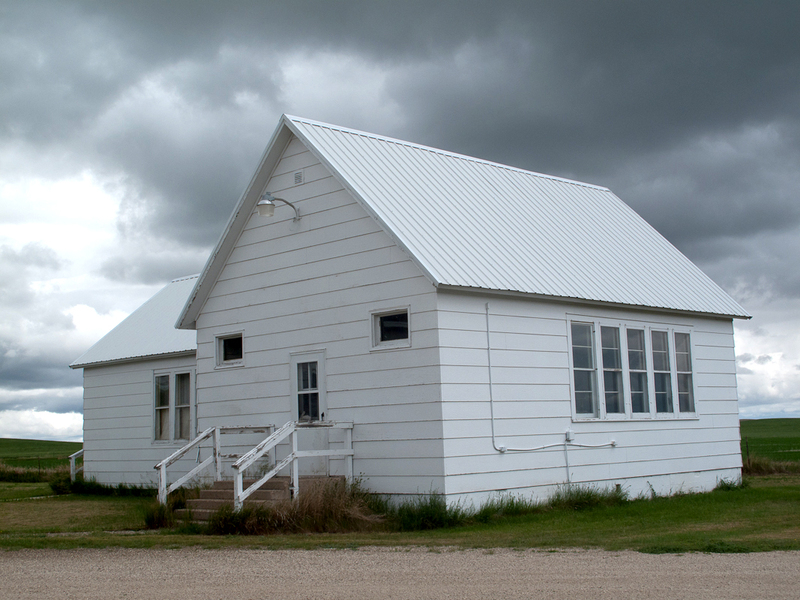 With a darkening sky as a backdrop this simple white building exuded the character of this harsh but beautiful land. 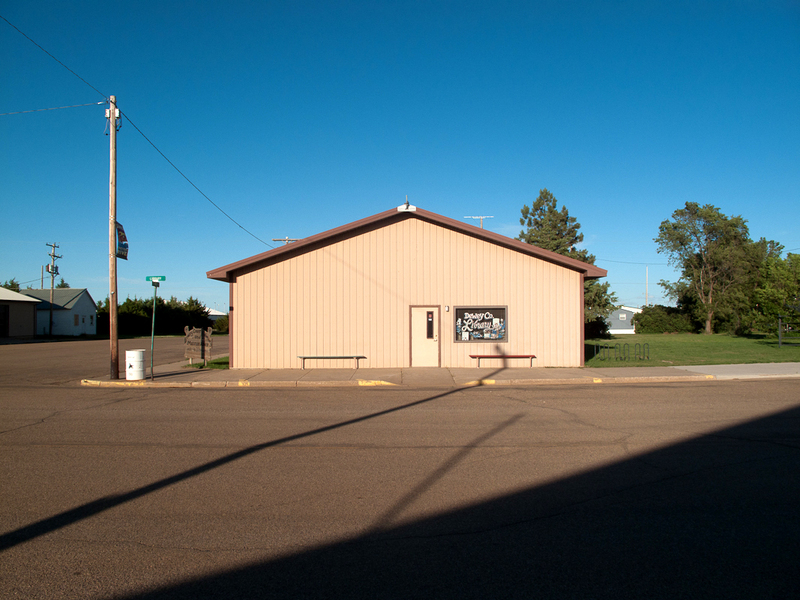 Near the border of the Cheyenne River Indian Reservation we visited the almost all-white town of Faith, South Dakota. Relatively prosperous and very tidy we saw almost nobody on the streets. The library contained the simple beauty of this place. East of Faith we entered the Reservation. 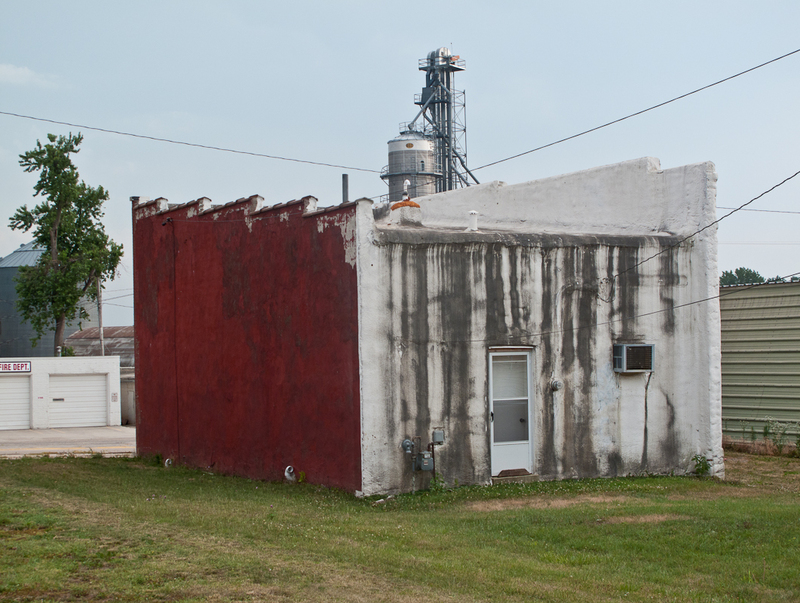 Though this is one of the poorest parts of the US this farmland area did not seem destitute. Eagle Butte, SD is the center of this area that is almost all Indian. Here is where we saw real poverty. 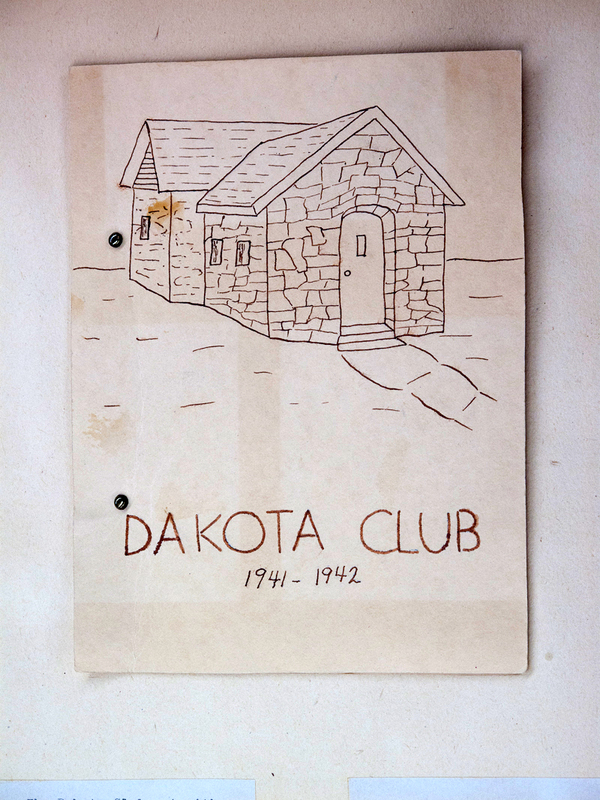 It also contained the incredible Dakota Club Library. 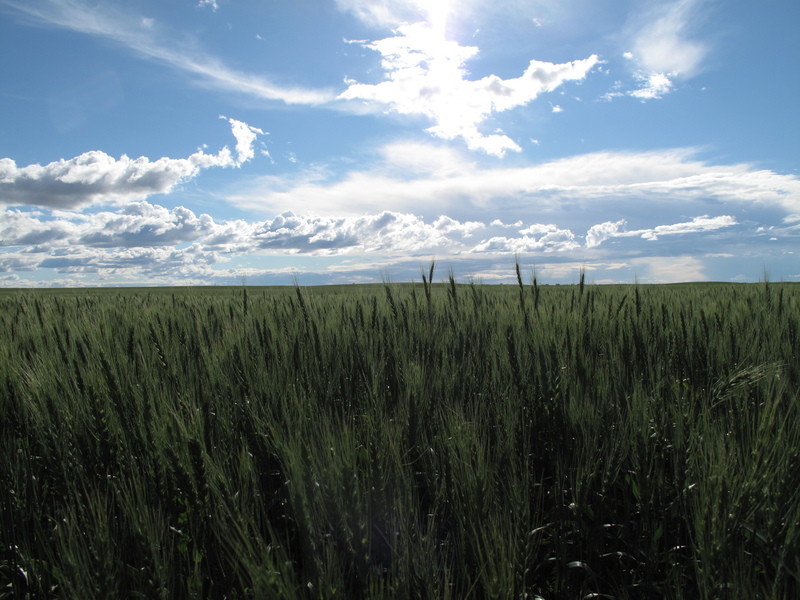 In the 1930s, Eagle Butte was an all-white town. 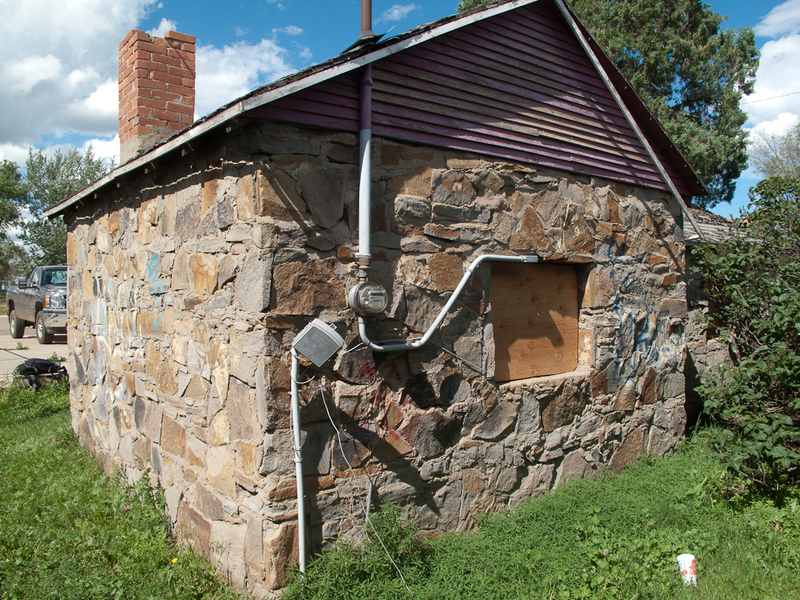 A group of civic-minded women started the library in an old pioneer sod house thatwas later covered in rock. The very helpful librarian was Northern Cheyenne and came from Lame Deer, MT but had gone to college in Rutgers, NJ. The old library was closed and the new one was in a windowless metal building. The outside of the old was sadly covered with graffiti. The new library had two computers but only one was working. This was the only internet connection for a town of 3,300 people whose annual per capita income was $5,000 a year. With a 70% unemployment rate It was simply too expensive for people here to pay $40 a month for the internet, let along buy a computer. While I photographed, Walker walked around town. He saw three guys smoking crack, a guy passing out in the middle of the Main Street and a kid getting arrested for drinking alcohol in public. Two drunk guys aggressively asked me for money. When I politely said no they wanted my camera. This was all in the span of one hour. 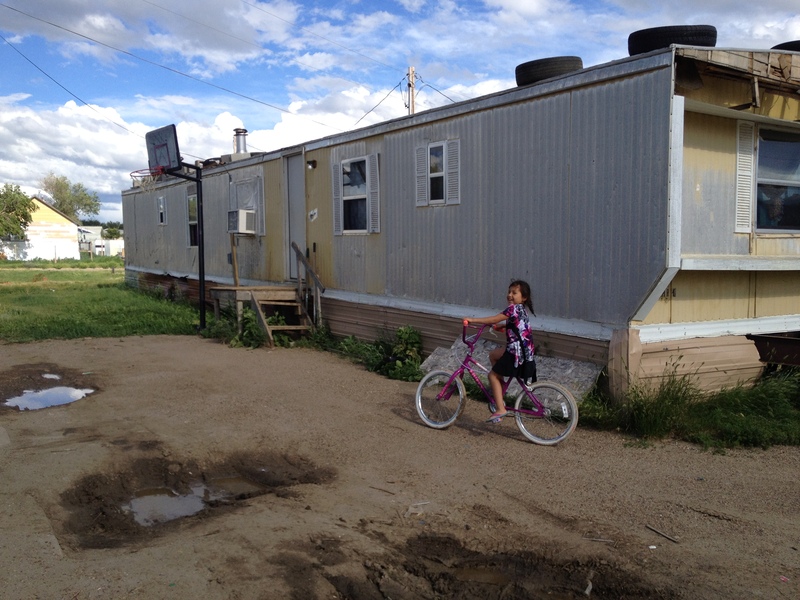 Life seemed rough for many people in Eagle Butte. The Christian mission belting out Bible songs on Main Street hopefully would provide some solace for the people here in need. Despite all this people seemed genuinely friendly towards us, especially the young. 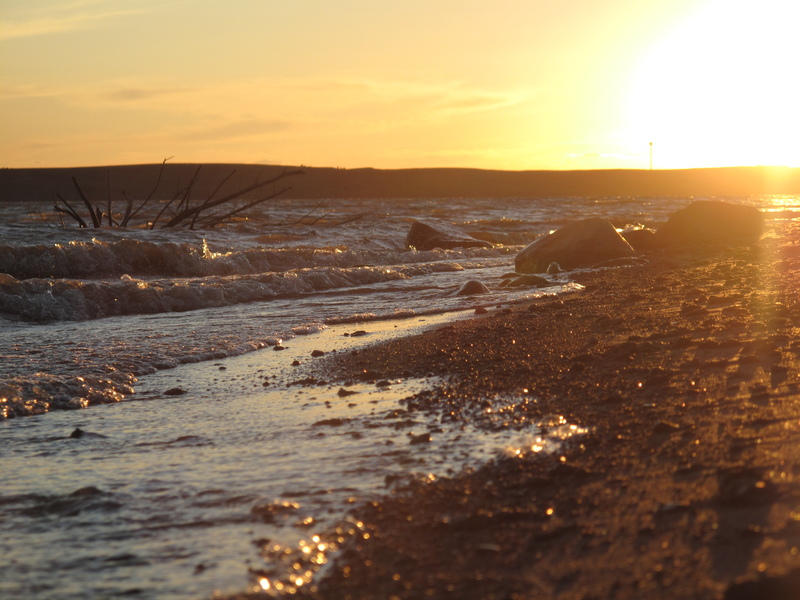 After driving along a long and spectacular dirt road we finished photographing in Timber Lake, SD. According to the librarian the relations are pretty good between the Indians and whites in this mostly white town. The library was severely beautiful, like the land itself. We ended the day in Mobridge, SD. 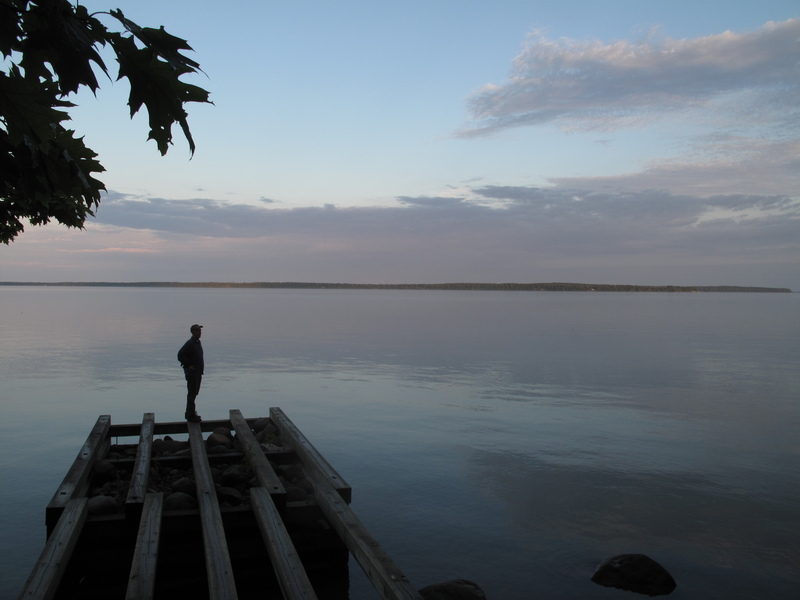 We walked along the wide Missouri River at sunset, ate dinner at a real 1970’s style restaurant, downloaded photos, blogged and then collapsed into a deep sleep. 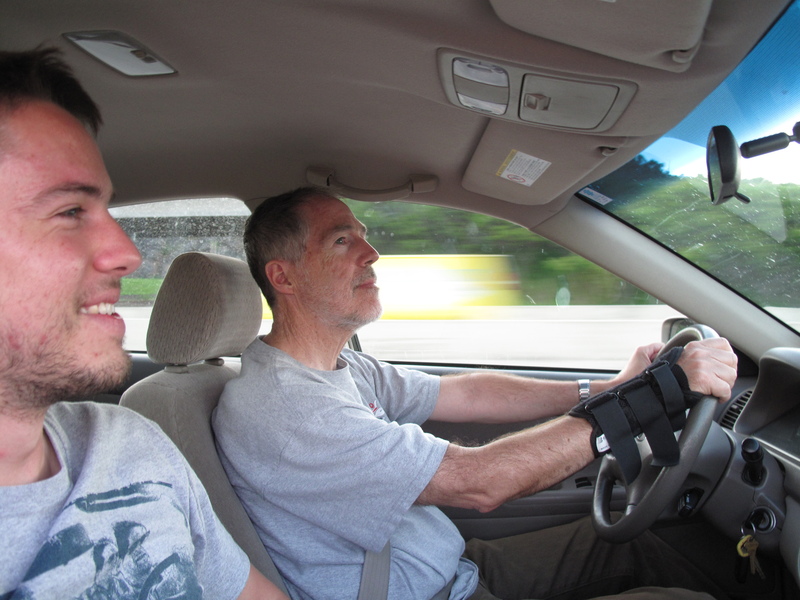 6/19/12 – Today was the third day of long, hard driving. 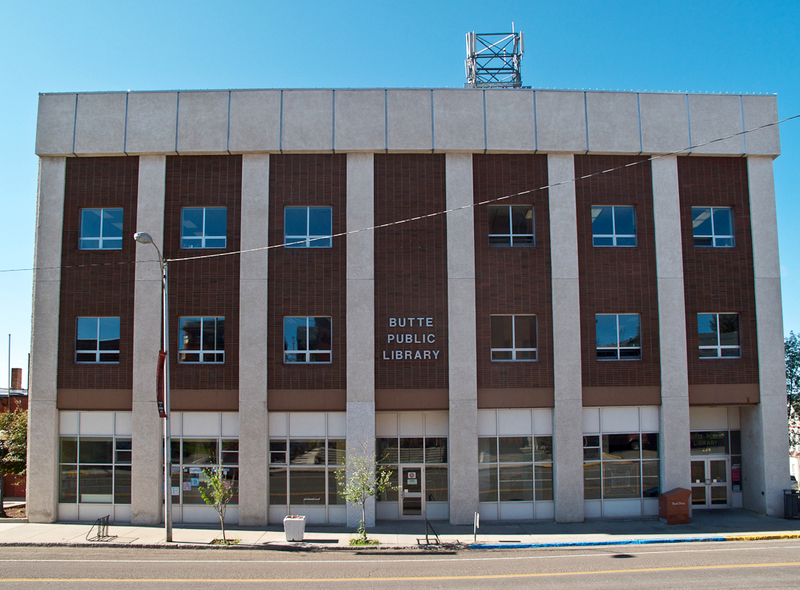 I met a wonderful librarian with her two month old son in front of the Butte, MT library. To me, she represented the new wave of young pioneers re-inhabiting and re-inventing Butte. Too bad the library wasn’t as beautiful as the rest of the city. 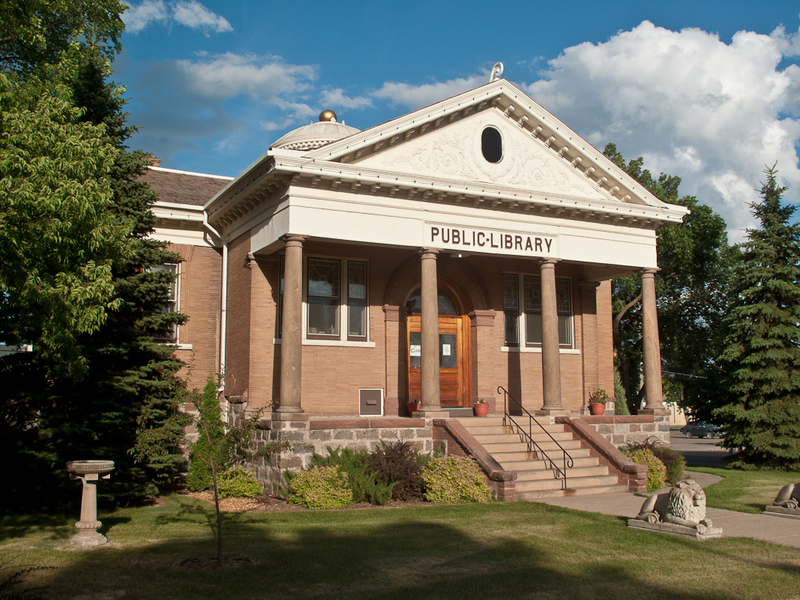 The small town of Anaconda (1/2 hour west of Butte) is home to the epic Hearst Free Library. Anaconda was home to one of the Heart Family’s most productive mines and Phoebe Hearst wanted to give back to the community that had enriched her family (as well as build a monument to the Hearsts). This stunning building contains wonderful artwork, an Audubon portfolio reproduction and lots of William Henry Jackson photographs of Yosemite and the Middle East. 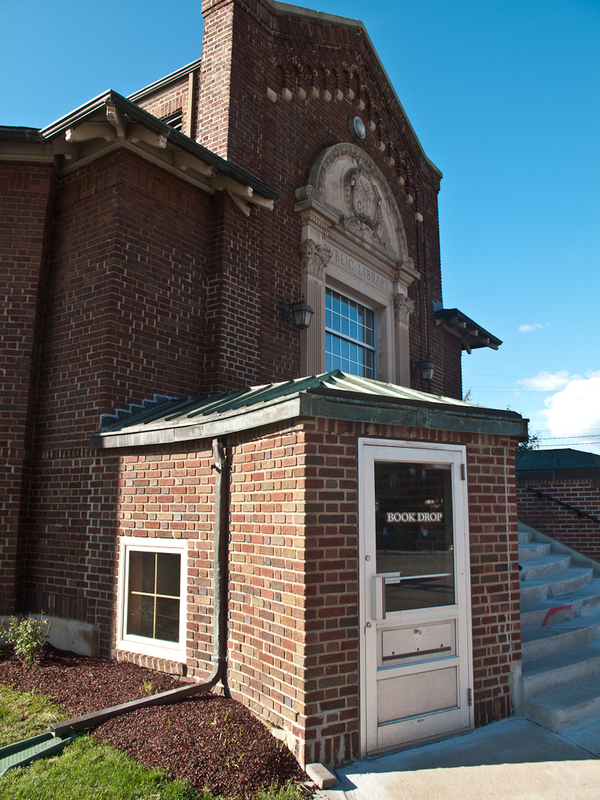 Here is an example of an outsized library endowed by a benefactor in a town that had seen better days. Such a contrast with Butte. Bozeman was a big unexpected hit for both of us. It is a delightful combination of college students, new age folks, outdoor recreation people, artists and cowboys. 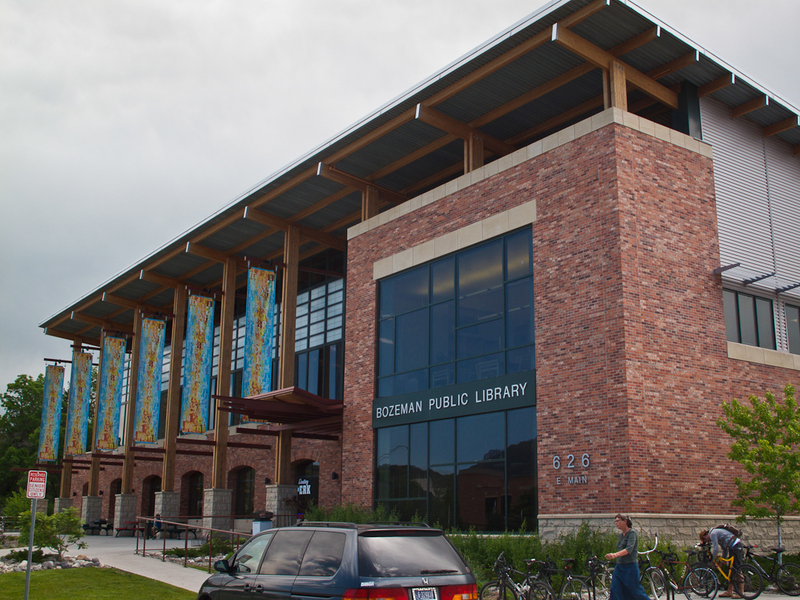 The modern, well used library fit perfectly into this eclectic prairie town. 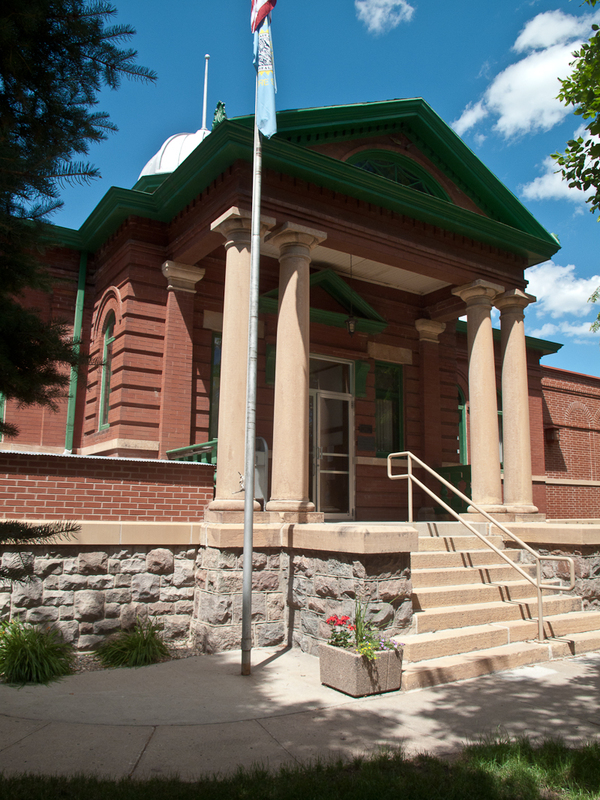 We quickly photograph the Carnegie Library in Livingston and then drive to Billings. 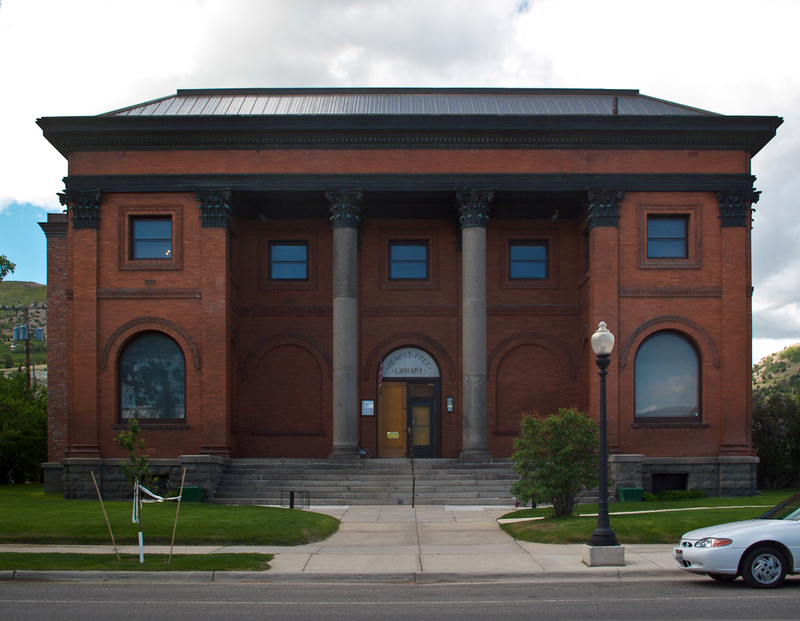 I know that Billings had a wonderful Carnegie that was being replaced by a new library. Unfortunately, by the time we arrived it had been completely eliminated with a large, plain looking library in its place. The town had a large Native American presence and seemed to have a large poor population. As we left we saw a sign with the title “The Meth Heads Dictionary” referring to the scourge of meth addiction that plagues much of eastern Montana. 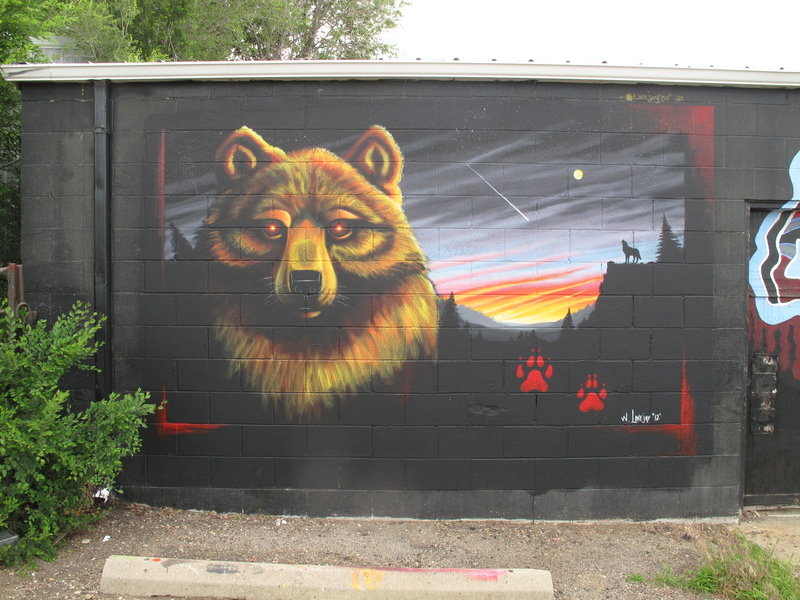 Hardin, MT is on the edge of the Crow Indian Reservation. 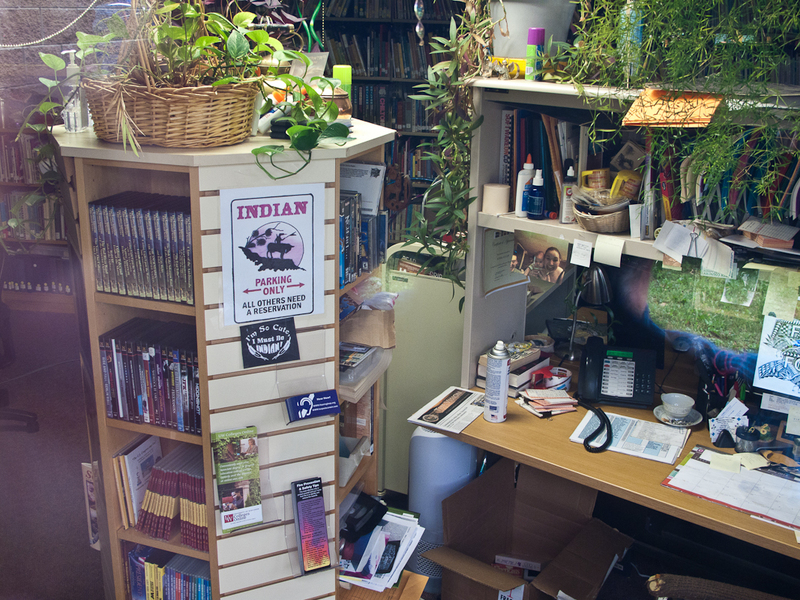 The outside of the small library had a classic look which stood out in the mostly Indian community. 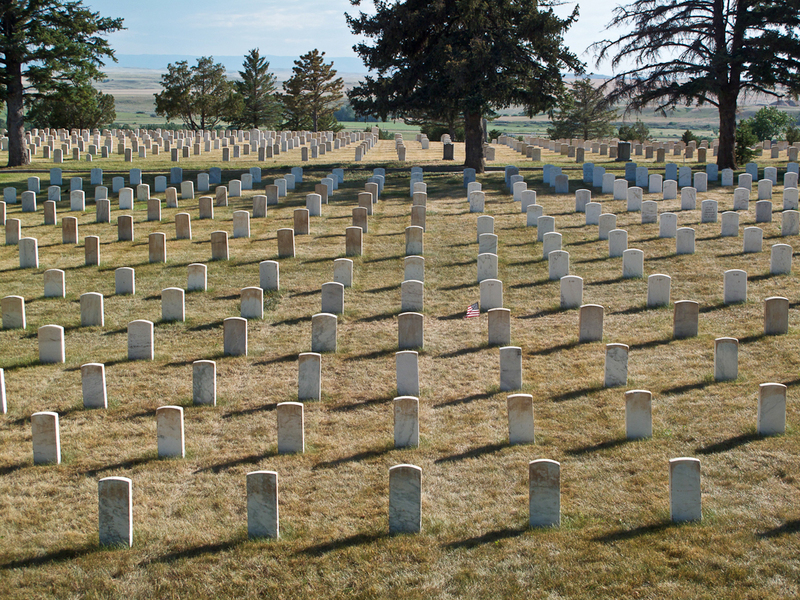 Our next stop was the Little Bighorn Battlefield National Monument, home of Custer’s Last Stand. The afternoon light cast long shadows from the headstones at the National Cemetery. As Walker and I climbed the hill to the Last Stand site the combination of wind and light produced a strange dream-like mood over both of us. 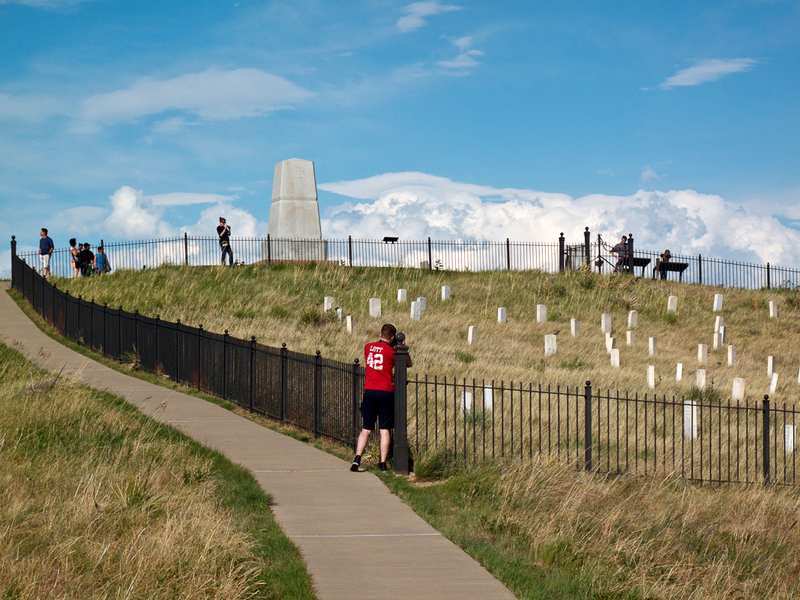 The emotional weight of what happened here reminded us of the Antietam Battlefield National Monument we visited last summer in Maryland. Reluctantly leaving we cross into the Northern Cheyenne Indian Reservation. We drive through the very poor communities of Busby, Muddy and Lame Deer feeling a little awkward in our car witnessing such poverty. 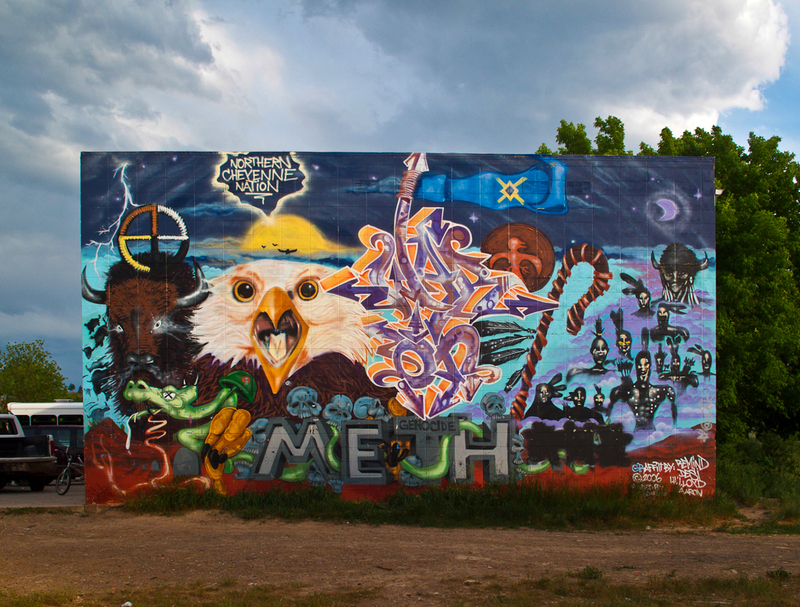 In Lame Deer I photographed a haunting mural called Meth Genocide while Walker went over to some Cheyenne kids on ponies and mangy dogs swarmed around us. We left the Reservation and came to Colstrip MT. I had seen photos by David Hansen on the effects of strip mining and the beginning of this little town. Here was the reality. Finally, we arrived in Miles City, MT around 9:30. It was just getting dark and only a smoking room was available at the motel. We quickly drove past the chain restaurants into the small downtown hoping to find something open. We lucked out finding a good Chinese restaurant next to a loud cowboy bar in the historic Olive Hotel. Walker practiced his Chinese with the amazed, young Chinese woman who waited on us. Even though we came from different cultures we all felt foreign here. I brought over a good Red Lodge, Montana beer from the bar and during dinner Walker and I marveled how far we had traveled over the last three days. We made Miles! 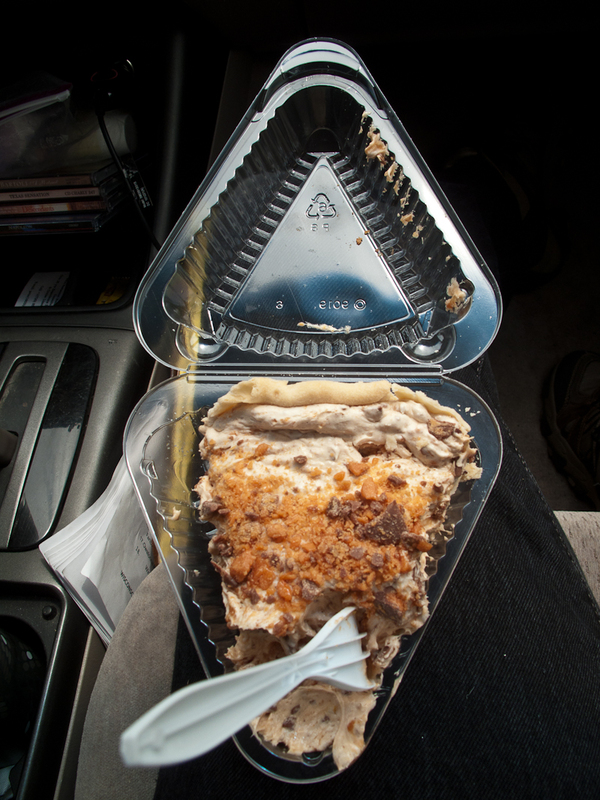 6/17/12 – Shoshone, ID was our first stop. I had seen the Library/City Hall building back home on Google Street View. 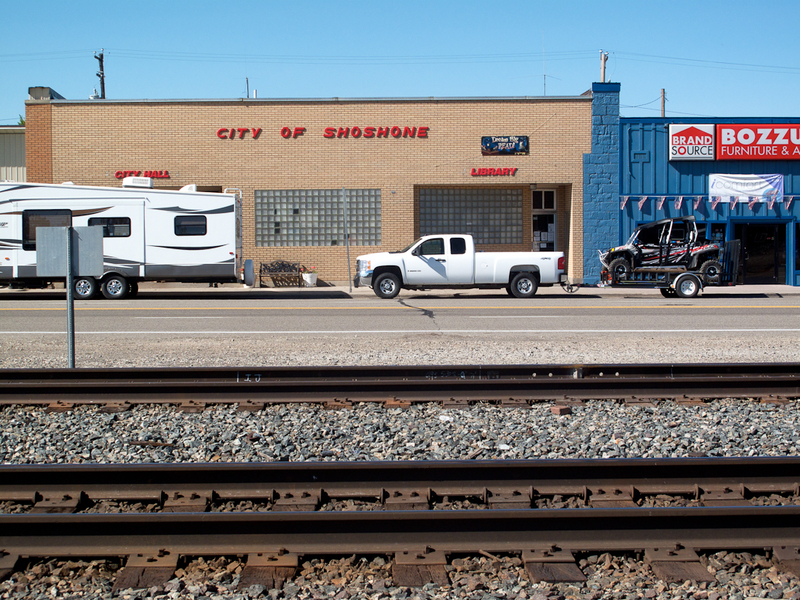 When we arrived in Shoshone the view was partially blocked by a trailer hauling a huge All Terrain Vehicle. I was disappointed at first but soon realized that this was the best shot. So much for my preconceptions. Pocatello was a nice, mid-sized Idaho town that was divided into two parts. It had a new side and a beautiful but abandoned (on Sunday) old town. The library was in the old part of town. 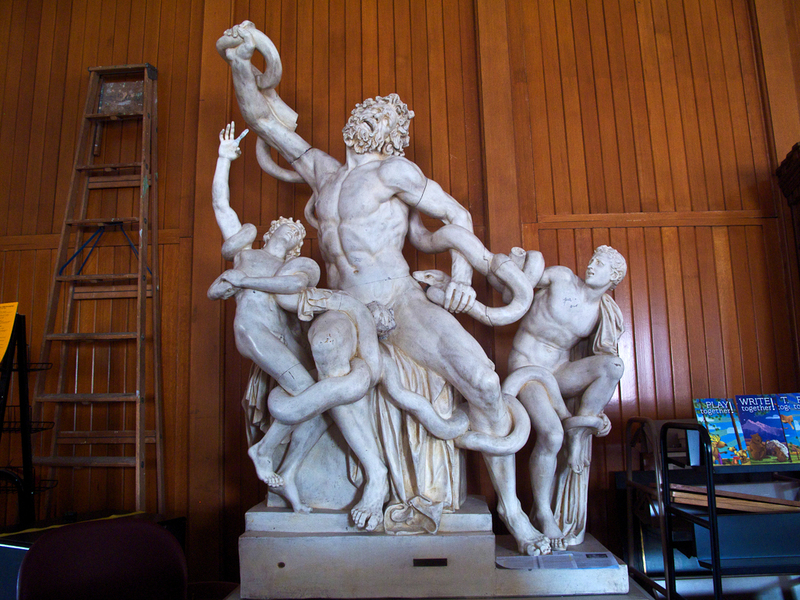 It had some great modern sculpture outside including one that surprisingly dealt with guns, violence and kids. Parked outside was the Pocatello Bookmobile with great graphics of Idaho icons. But no potatoes. We headed north and east to another icon – The Grand Tetons. This was the first time I had seen them from the west. From here they reminded me of photos of the jagged peaks of Fitz Roy in Argentina. 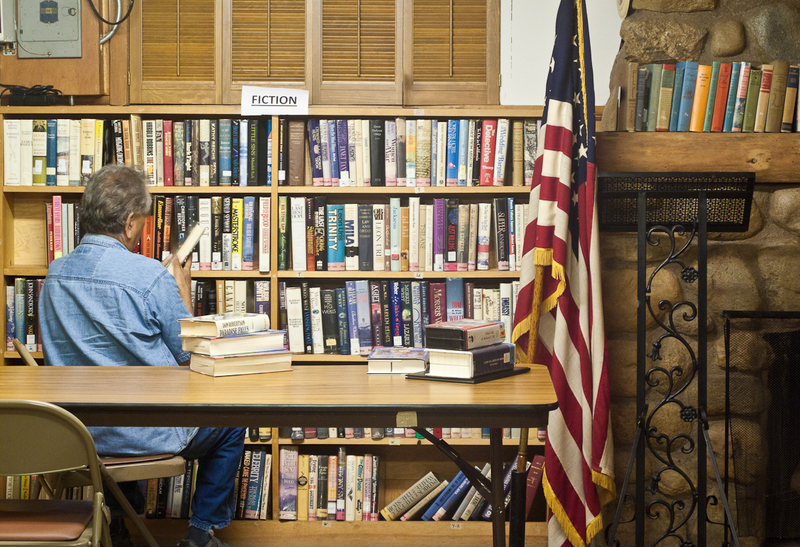 The Alta, Wyoming branch library has these grand Tetons as a backdrop. It was jaw-droppingly beautiful. After a long and wonderful drive over the Continental Divide we came to the little town of Dillon, Montana. Like Pocatello the old downtown is empty on this beautiful Sunday afternoon. The library is classic and had interesting sculpted faces on the sides. 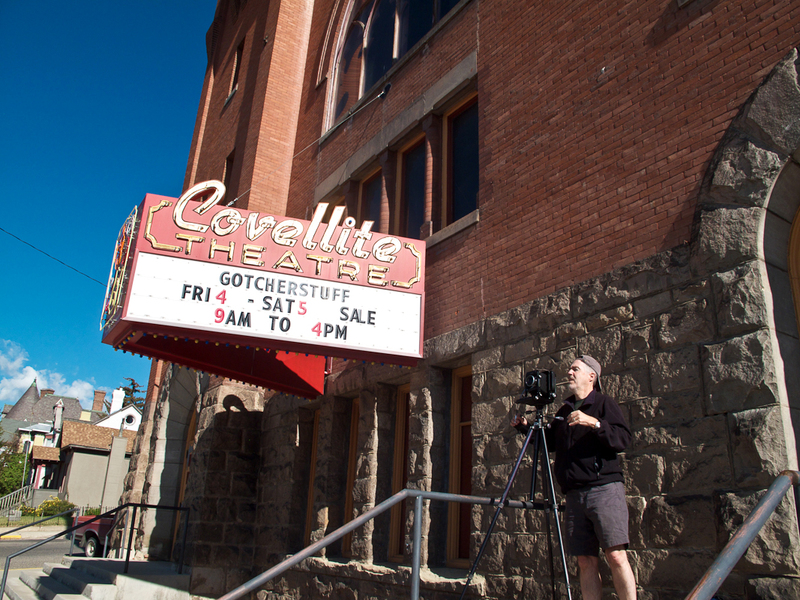 We end our long slog in Butte, MT. This is probably one of my favorite towns in the American West. Walker said we probably like it so much because it reminds us of San Francisco – great old architecture built on hills; cold and windy summer evenings and full of hobos. 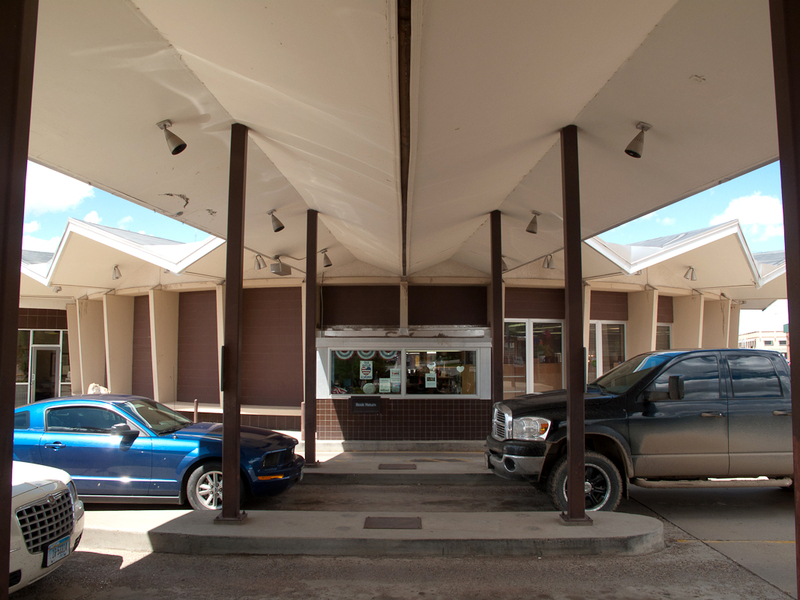 We have dinner at the M & M Café, a Butte landmark. In the evening light we drive around this incredible community trying to figure out how this once grand city survives. As we drive by the big library that I will photograph tomorrow my heart drops. In a city of architectural splendor the library is probably the plainest building in town. I find out later that the gorgeous old library that I thought would be here had burned down twice. This was the replacement. 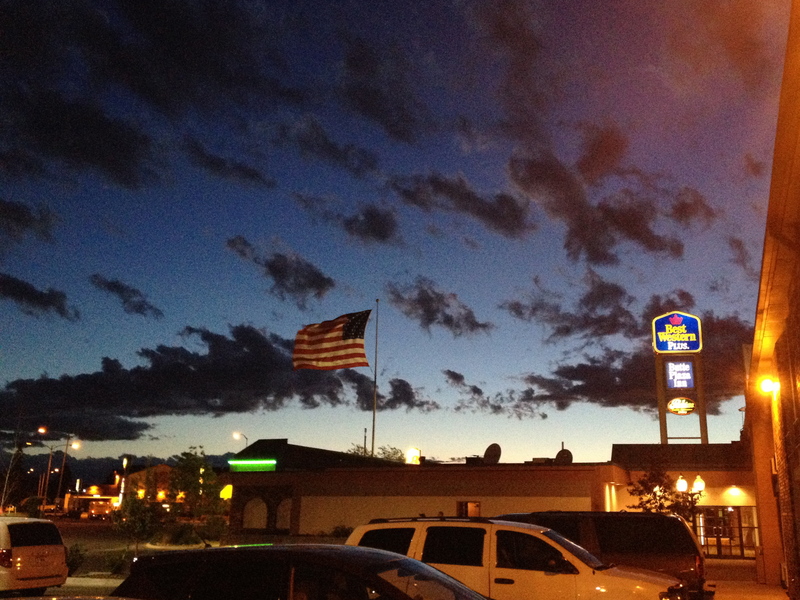 6/17/12 – The first day of the Library Road Trip 2012 was spent driving twelve hours through three states – California, Nevada and ending in Twin Falls, Idaho. We spent most of that time in our air conditioned bubble listening to Ry Cooder and a book on CD called 1491 from our local Noe Valley branch library. 1491 is the great book by Charles Mann about pre-Columbian America. Our first impressions of the trip are: the Sacramento Valley is (still) incredibly hot (103 degrees); Interstate 80 is almost a continuous stream of traffic and sprawl from the Bay Area to Auburn; Nevada is majestic, strip mined and awe inspiring; and Idaho is gorgeous in the evening light. 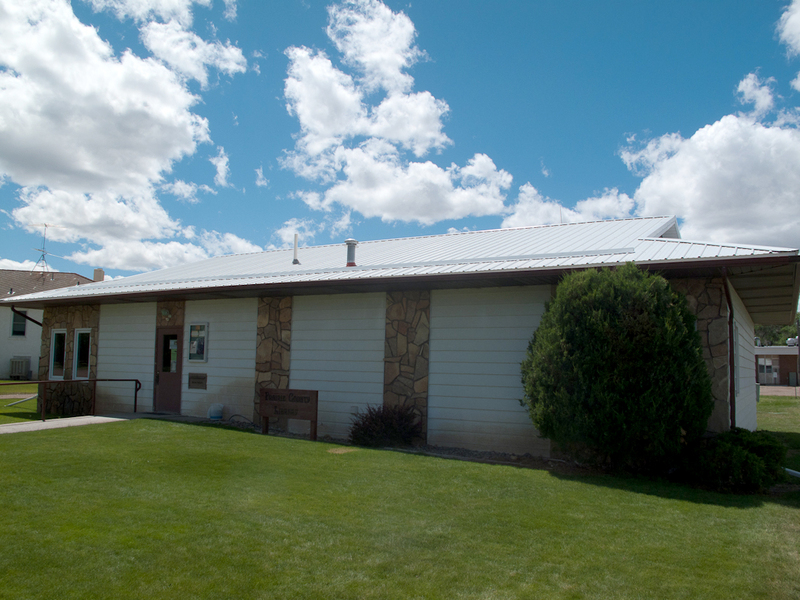 I quickly photographed one library in Jackpot, NV. As the sun set I clicked away at this austere, prefab building as two Native American kids played basketball nearby. During a quick pit stop at the Cactus Pete’s Casino Walker and I got the distinct impression that this Nevada border town was where the pious Mormons of Idaho come to have a little sin. The road between Jackpot and Twin Falls, ID was filled with police cars stopping the ones that may have sinned a little too much. News on the book and the next Road Trip! Walker and I are setting off on the road again next week to complete my photographic survey of American public libraries, which will become a book in 2013! Follow this blog for news and on-the-road photos as we jump back into the wild life of road trips and library photo sessions. For more on the project, visit my webpage at [coming soon]. And as always, feel free to comment here and ask me questions.